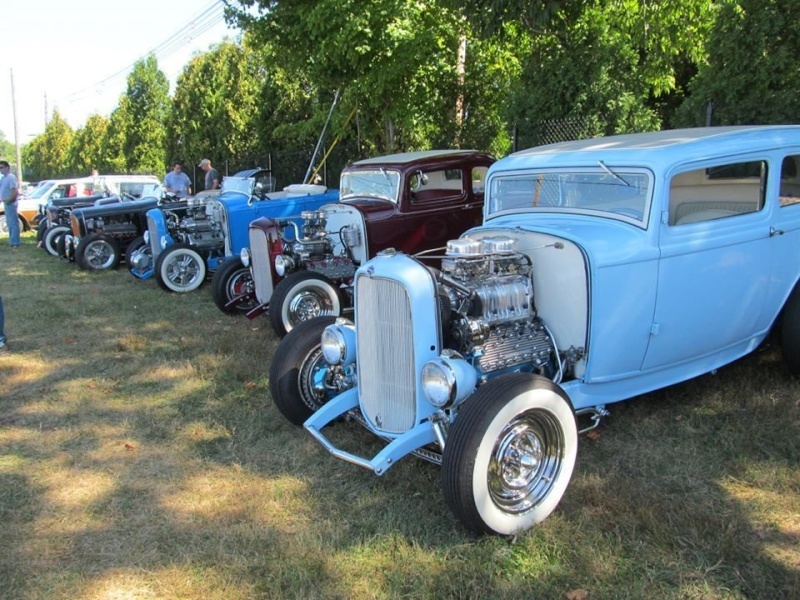 Retro-rods are back. 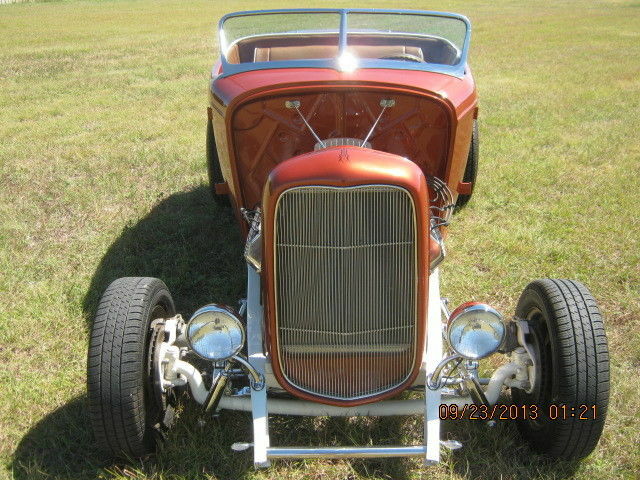 I’m not talking about the primered “rat rods” that you see lying around on eBay, or other intentionally rusted projects, but rather cars that were built in the early days of hot rodding and restored today to their original modified condition, rather than stock. 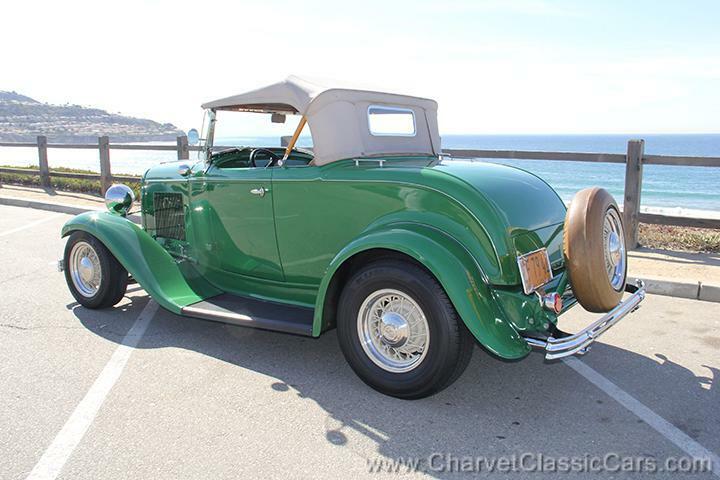 Names like George Barris come up all the time, and the fact that some of these cars are showing up at places like Pebble Beach suggests that the tide has turned in the collector car hobby. Today, some of these cherished relics command prices normally reserved for pedigreed Full Classics. 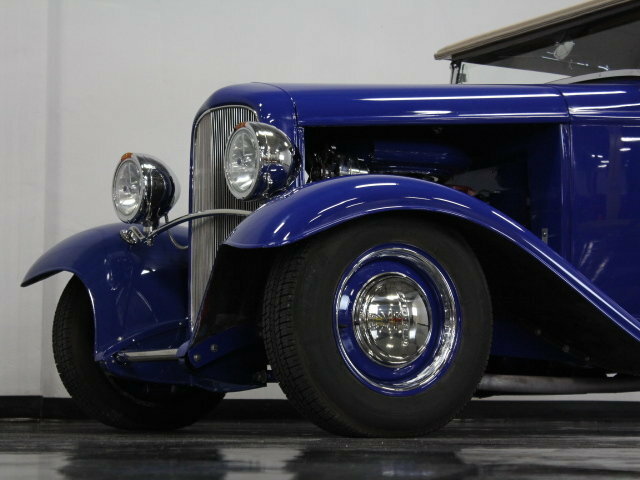 But if you’re an ordinary fellow with ordinary means, your chances of owning one of these pieces of hot-rodding history are about as good as making a personal visit to Mars. 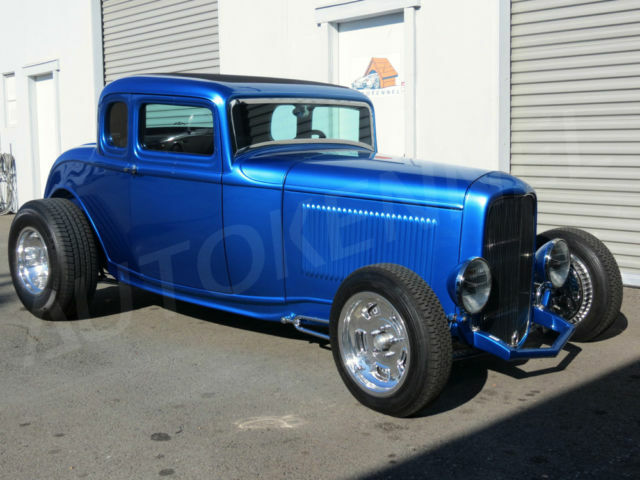 Instead, your best bet is to build one for yourself, as one enterprising gentleman from the other side of the Atlantic did with this killer retro-styled ’32 Ford 3-window coupe. 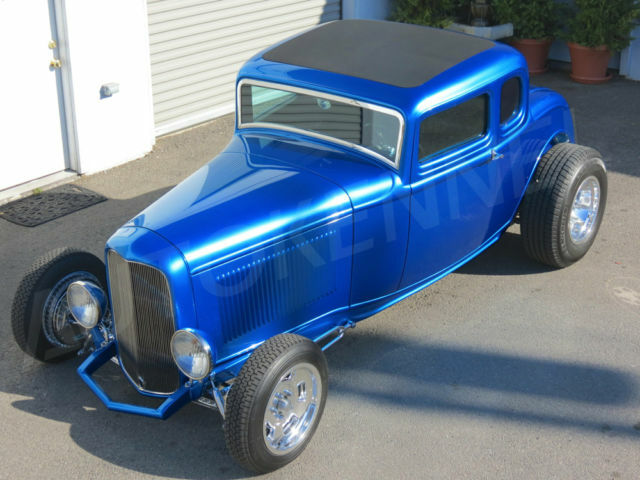 Clearly inspired by the Clarence “Chili” Catallo / Alexander Bros / George Barris ’32 Ford coupe that graced the cover of the Beach Boys’ “Little Deuce Coupe” album, this 3-window has a ton of retro appeal combined with today’s latest technology to build a show-winner that has graced the pages of several magazines and will draw crowds at any show you attend. 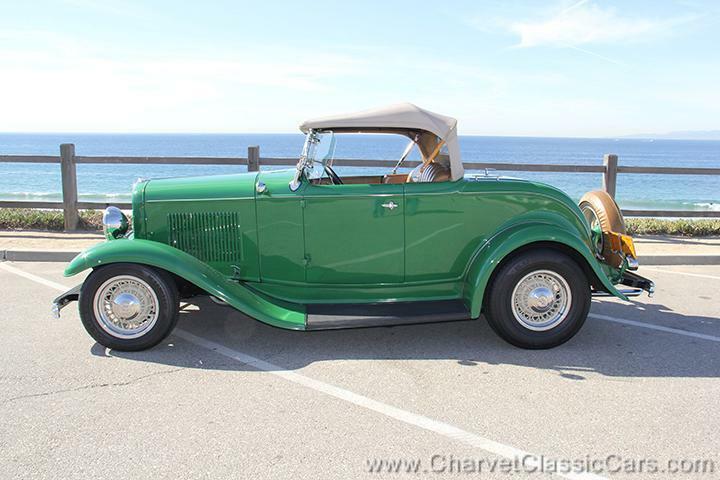 The body is fiberglass, and like all great rods, has evolved over its existence. 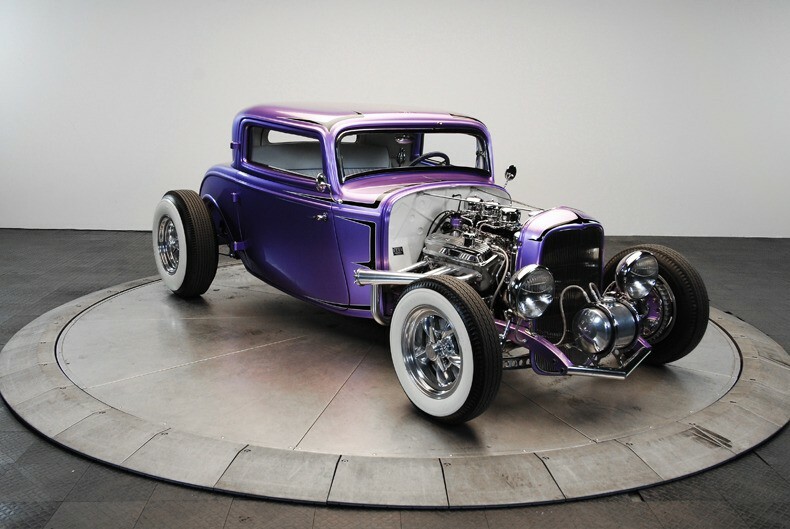 Originally simply a purple 3-window coupe, the recent scallops and fade job elevate it to an entirely new level. 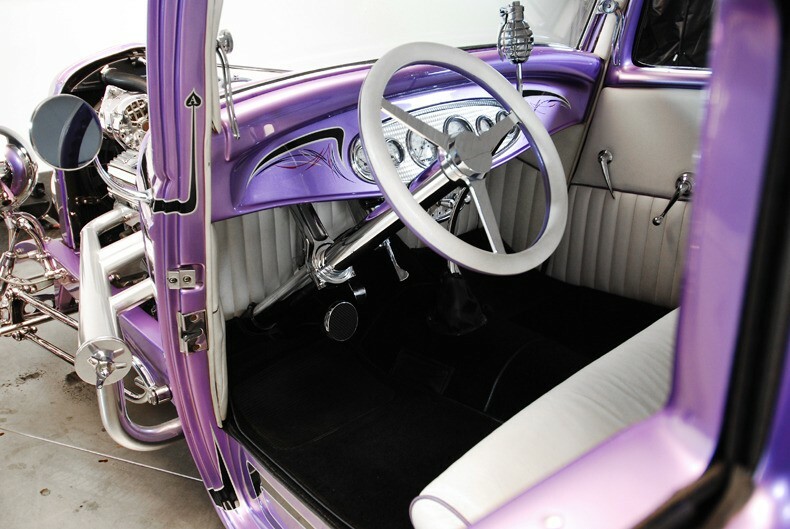 The style definitely dates the car to the late ‘50s or early ‘60s period, where customs and hot rods were overlapping in a big way. 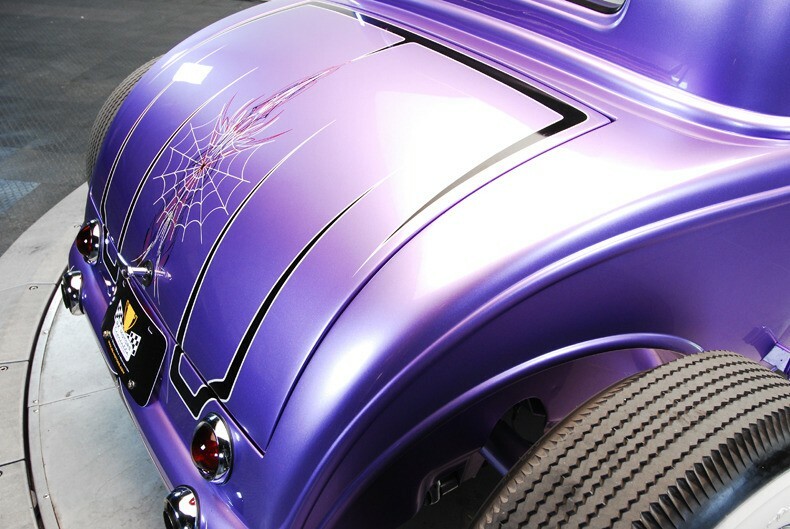 With a ton of candy and pearl in the paint, it borders on artwork that you can drive and evokes a very authentic vibe from onlookers who were there. The bodywork has been done to period standards, which were good, but not with the scientifically-calibrated body gaps that we enjoy today. 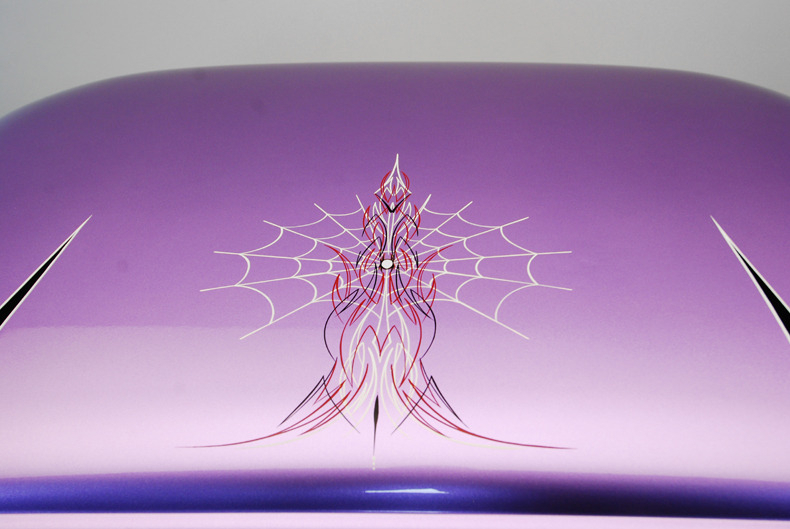 In some light, the paint has an almost satin-finish to it, but other times, it’s highly glossy with the trick scallops and custom spiderweb graphic on the rear deck buried under a layer of clear for a seamless look and feel that is very contemporary. This is a very convincing tribute to some of the past greats. Trick details abound, too. 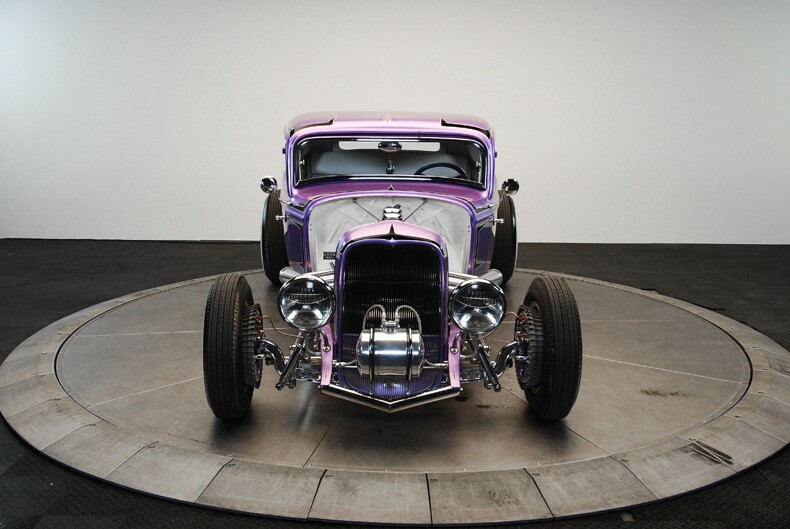 Dig the V-shaped front spreader bar that’s been chromed, and the stainless steel tank at the front of the car which is designed to evoke the Moon tanks used on early dragsters (mounted up front so acceleration would help force the fuel into the carburetors). 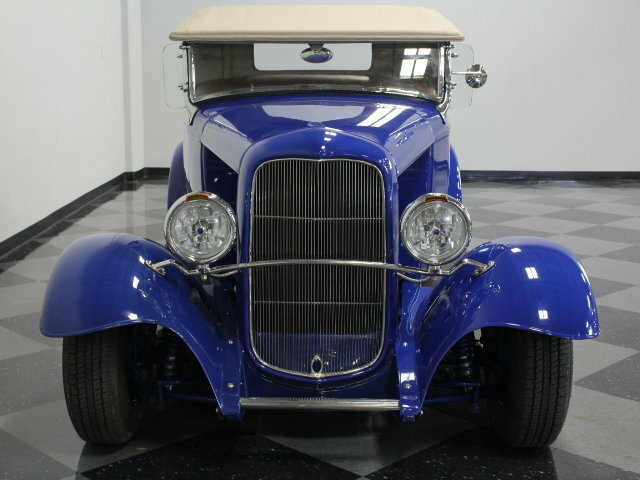 The ’32 grille shell has been chopped down and filled with a matching insert that keeps this car’s profile nice and low. 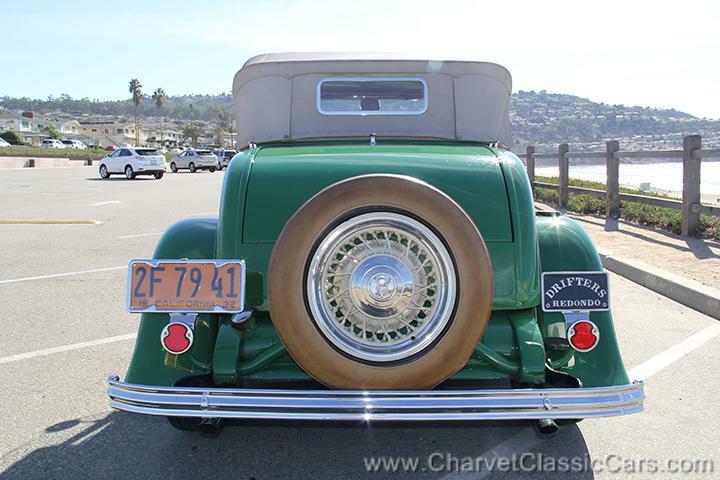 I love the polished ’34 Ford commercial headlights and the original-style door handles. 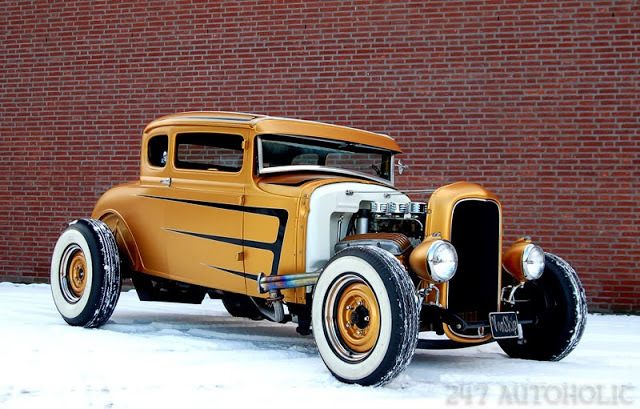 King Bee “peep” mirrors on both sides give you surprisingly good rearward vision, and out back, the simple taillights and exhaust pipes poking through the lower valence are a timeless look. One thing that never goes out of style is a small-block Chevy. 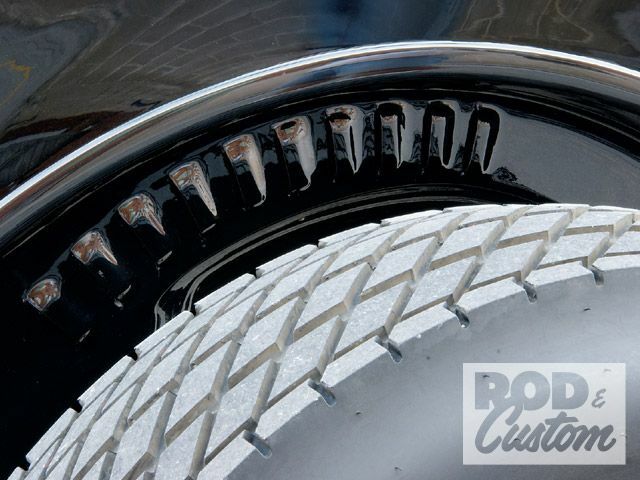 They were the engine of choice 50 years ago, and they’re still in fashion today. 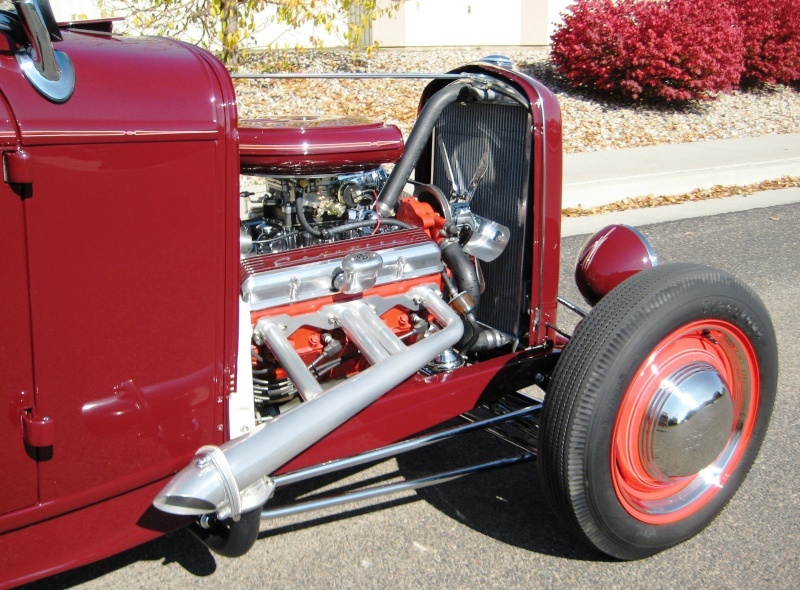 The one in this 3-window is a modern ZZ4 crate motor, which makes 335 horsepower thanks to a reproduction Tri-Power setup that features three 2-barrel carbs. 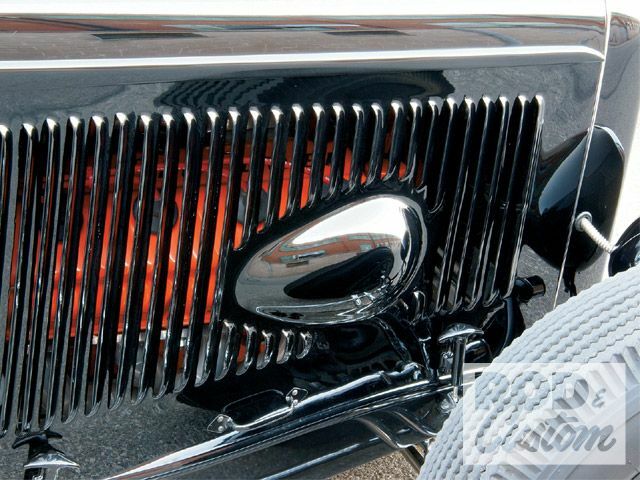 Tons of chrome make it sparkle, including those cast aluminum Corvette-style valve covers and alternator. You’ll notice that the block and heads are painted to match the body, and the headers are ceramic coated for long life and a great shine. 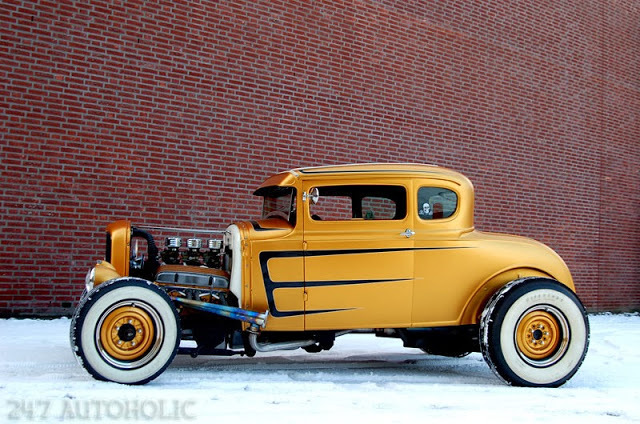 A new radiator with electric fan keeps it cool in a way that they couldn’t imagine in the early days of rodding (where an overheating rod was not only common, it was expected). The recessed firewall that’s been painted white is an outstanding period touch. And don’t worry, the combination has been tested and perfected over the past 50 years, and it runs beautifully. 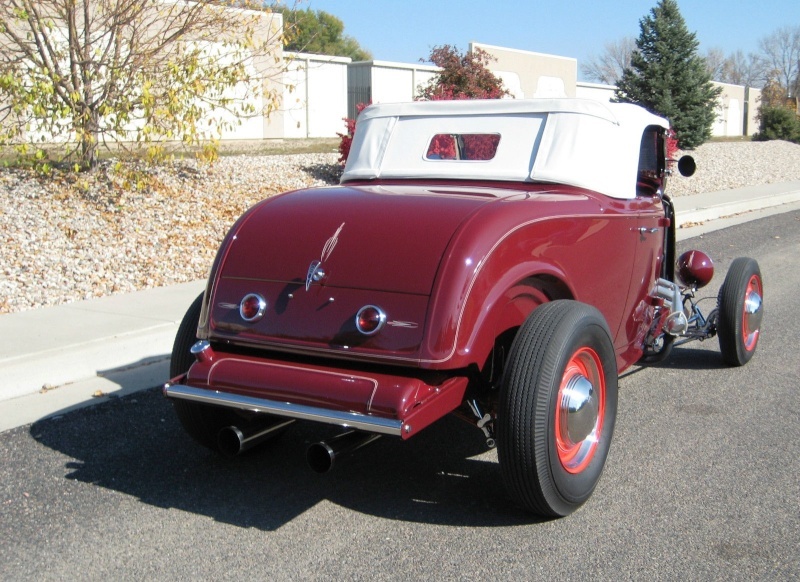 The carbs aren’t finicky, the exhaust is modest, unless you uncap the headers, and it drives more like a real car than most vintage jalopies ever managed. A lot of the credit for its great road manners also has to go to the expertly built chassis. Yeah, it’s got rigid axles and leaf springs, but like the engine, the combination has been perfected over the past few decades and these cars track straight and ride better than you’d expect. 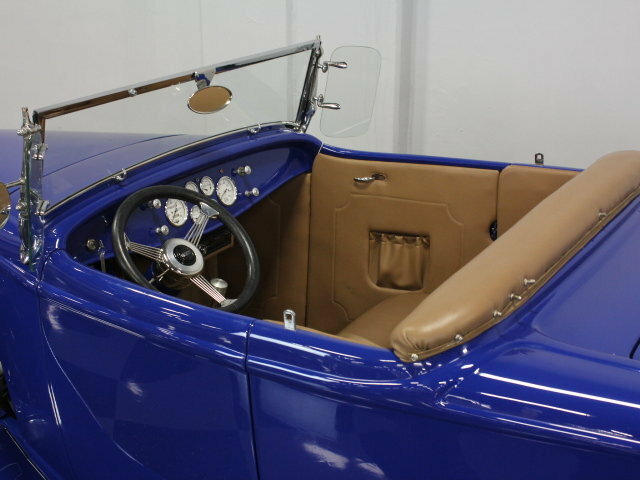 The frame rails are painted to match the body, but just about everything else has been polished or chrome-plated. 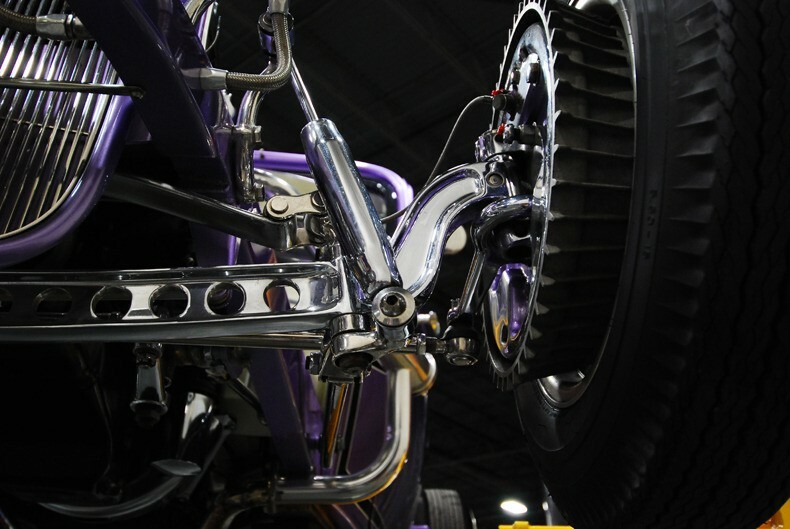 The dropped front axle has been cross-drilled to lighten it, a familiar hot-rodding trick, and chrome wishbones keep it out in front. 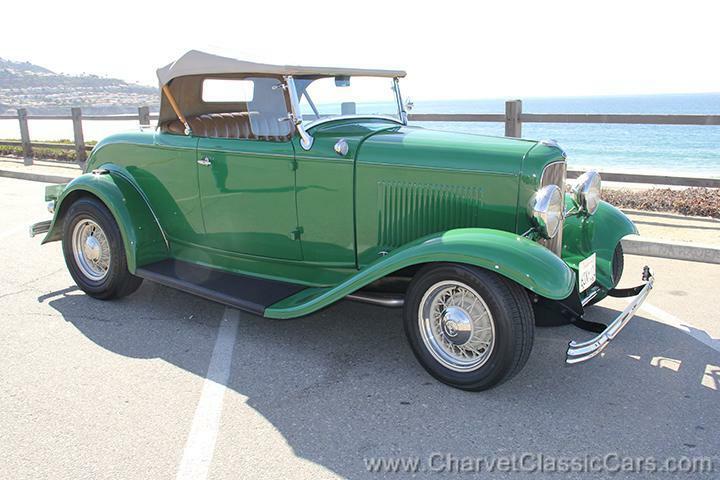 The transmission is a modern 700R4 4-speed automatic, which makes this car a great long-distance cruiser. Out back, it’s a TCI quick-change differential with painted tubes hanging on a set of coil-over shocks. 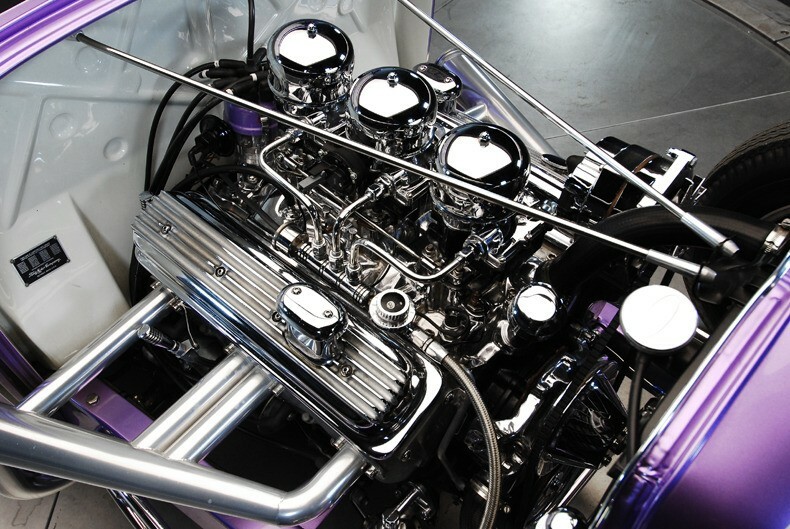 A brilliantly polished stainless exhaust system features glass pack mufflers for an authentic sound, and you’ll note that the bottom of the body has been painted white to really show off the details. Rolling stock consists of outstanding reproduction Torque Thrusts with spinners on period-perfect Firestone bias-ply wide whites. 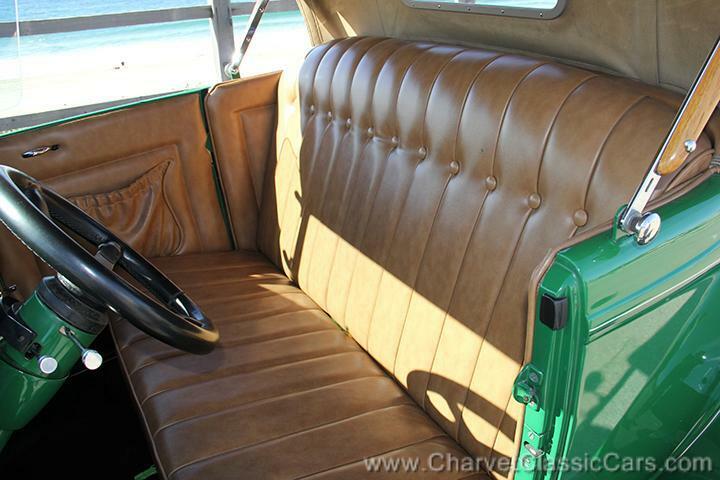 The vintage look continues inside, with ultra-traditional tuck-and-roll white leather on the bench seat and door panels. 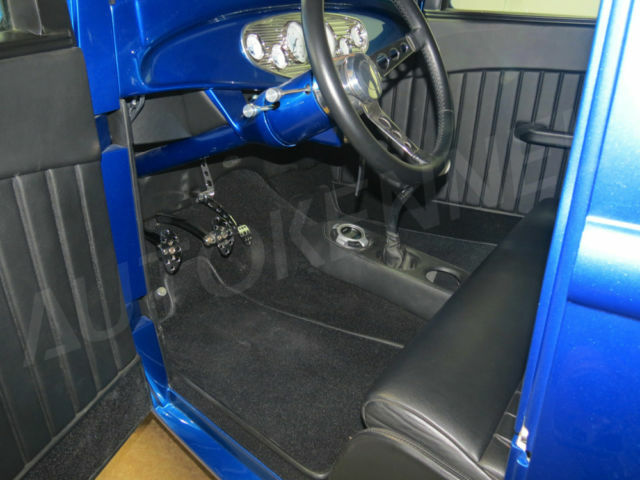 Extremely well done, the fit and finish of the interior matches the standards set by the rest of the car. 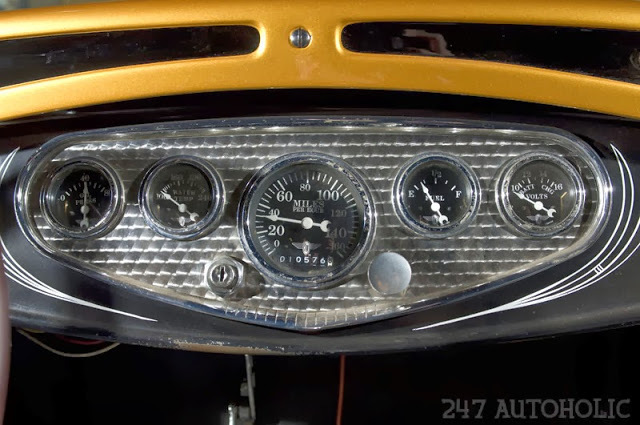 Dig the painted dashboard with the machine-turned gauge panel, which houses a complete set of Stewart Warner gauges. 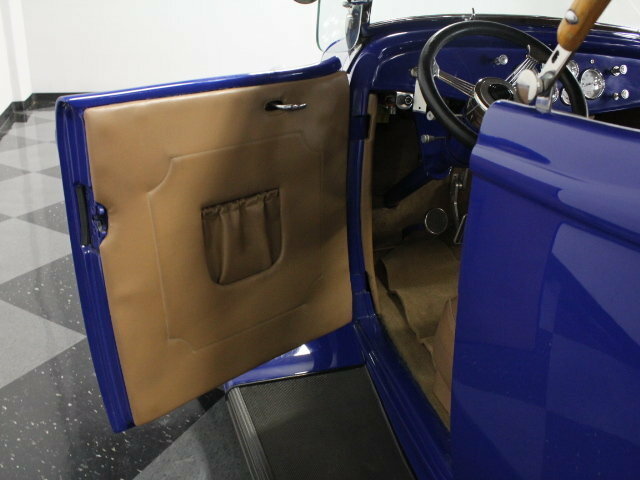 A matching panel has been fabricated for the ignition and light switches, and hangs right underneath. And yes, that IS a hand grenade acting as a shift knob. 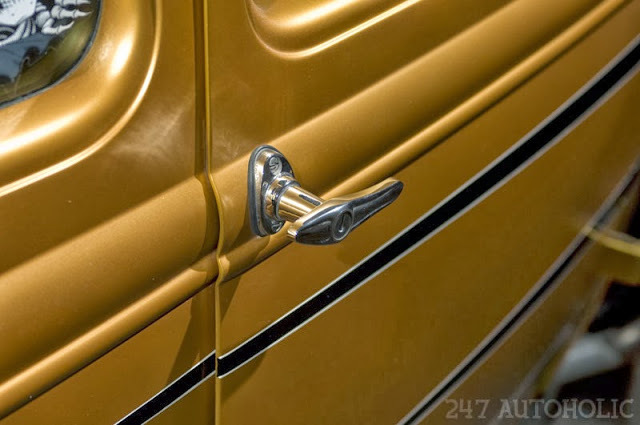 Other retro touches include the spoon-style accelerator and round brake pedal, reproduction knobs and handles for the door latch and windows, and even a pin-up girl airbrushed onto the window frame. 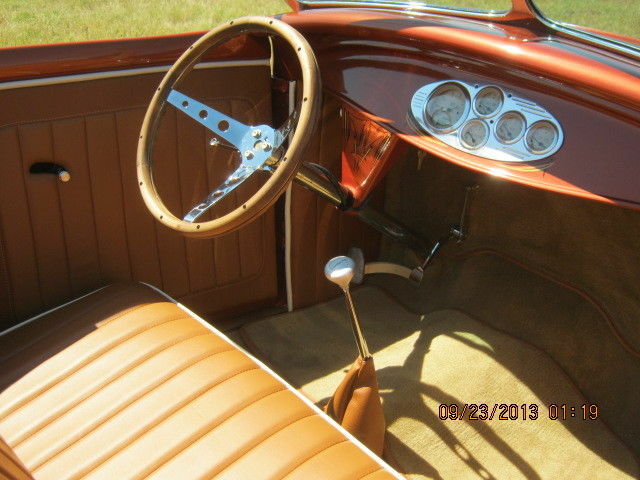 The steering wheel looks like a track reproduction, and is wrapped in matching white leather. 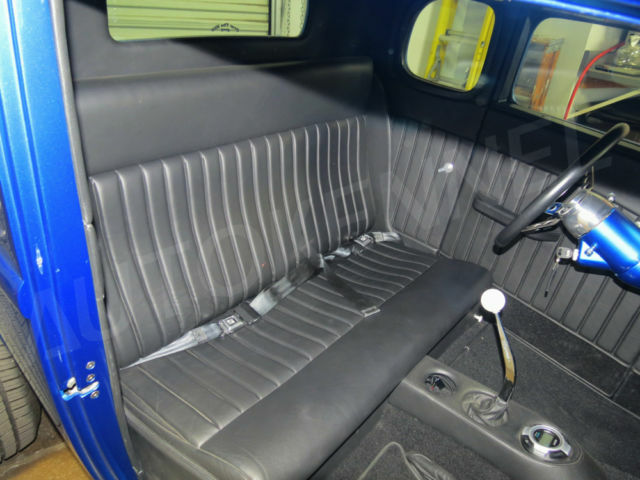 In back, you’ll find that the trunk has been upholstered to match with more pleated white leather and a custom-made Moon fuel cell that matches the tank up front. This car has been well-documented, too, appearing in the 2008 Goodguys Rod d’Elegance Goodtimes Gazette, on the cover of the August 2008 Goodguys Goodtimes Gazette, in a September 2008 issue of “Rods of the World,” and on the cover of the 1999 American Rodder Buyer’s Guide (which is interesting, since the car was built in England). And if you speak German, it also appeared in the European magazine “Wheels” in January 2000. 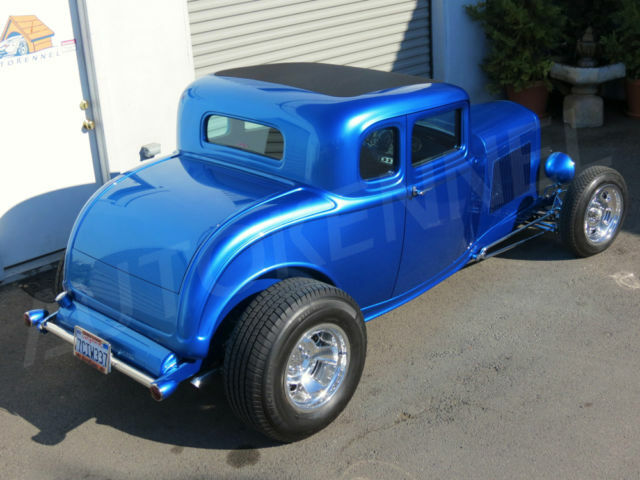 So if you’re into the retro rods, but aren’t interested in some homemade looking primer-mobile, take a good, long look at this ’32 3-window coupe. With a lot of traditional features combined with invisible 21st century components, it’s a great driving show car that will draw a crowd anywhere you go. 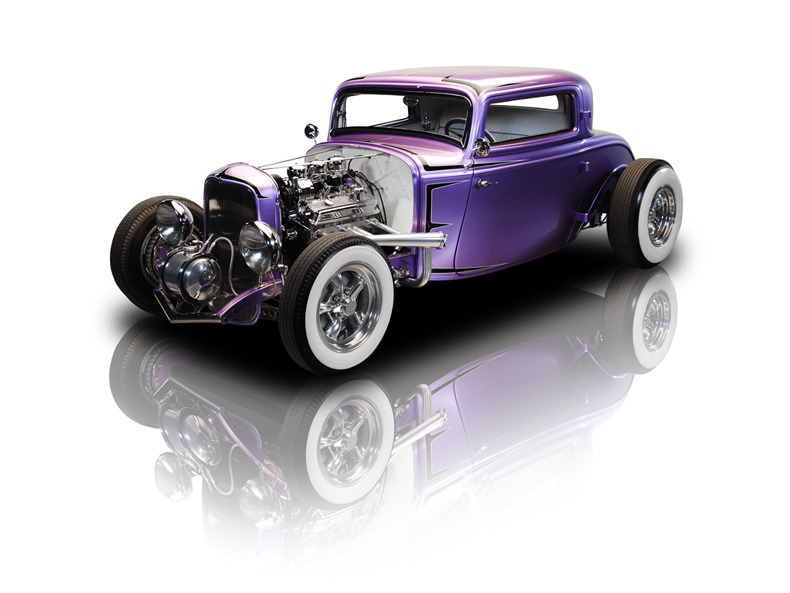 And we’re not alone in our appreciation for this one—all the magazine articles and other accolades this car has won are proof enough that vintage hot rods are red hot right now. 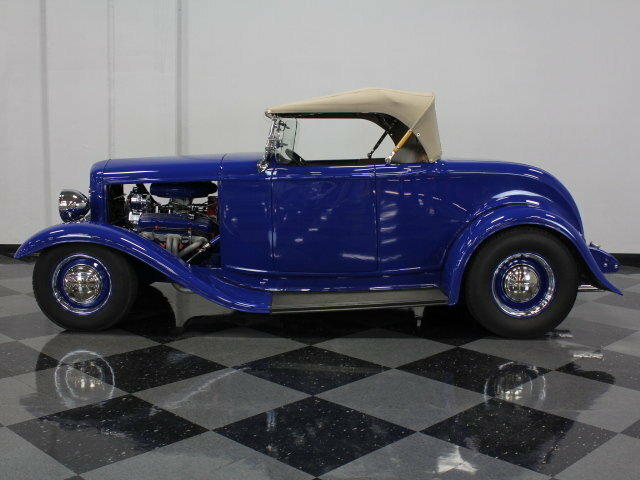 Offered at a fraction of the construction cost, it will be hard to have more fun in a car than you will with this ’32. Call now! 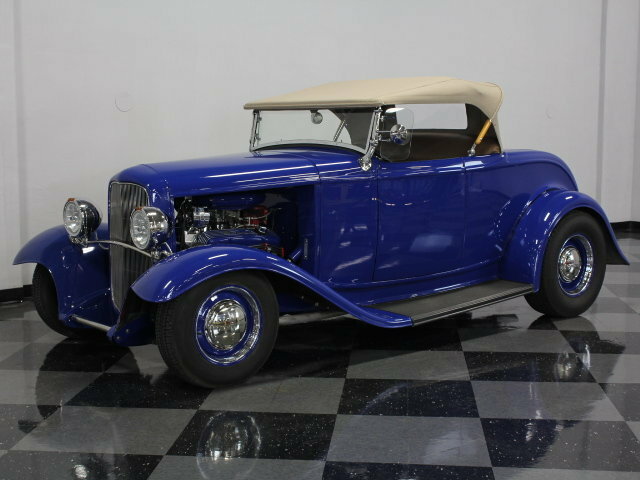 this gorgeous 1932 Ford roadster was built by a professional restorer for his own personal use, so you know the quality is impressive and the look is timeless. 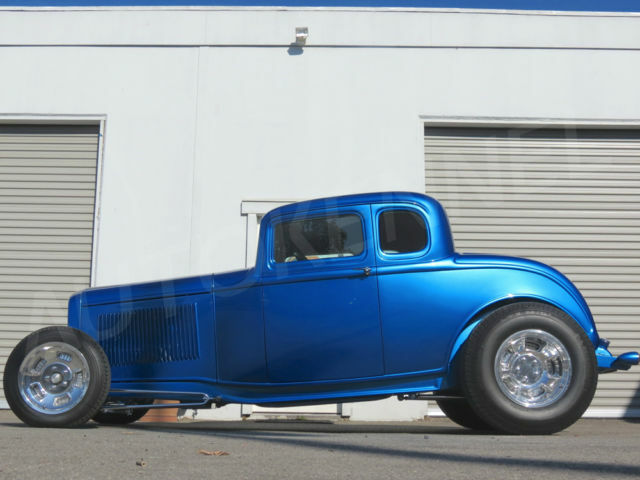 With reliable Chevy power and a few custom tricks you may not have seen before, this awesome rod is shockingly affordable. 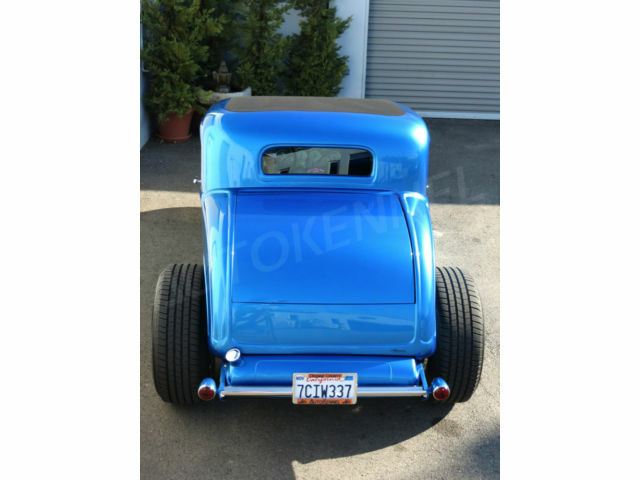 It's a fiberglass body, but the finish quality is extremely impressive. 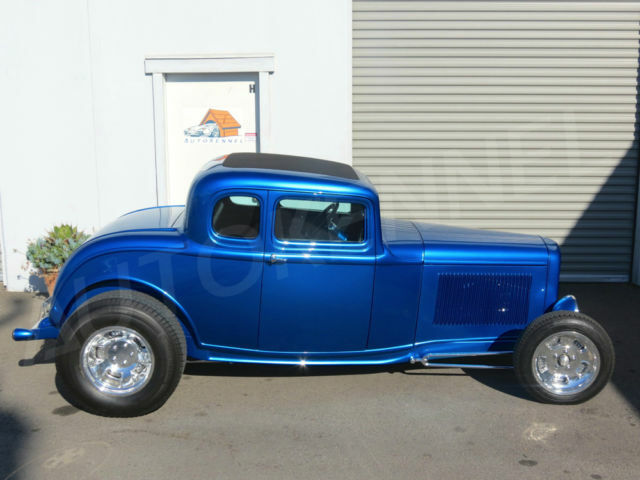 All the classic '32 Ford design details are there and aside from shaved door handles, it could pass for a Henry Ford creation. It doesn't try anything radical, instead sticking to the idea that quality matters and that the details make it special. 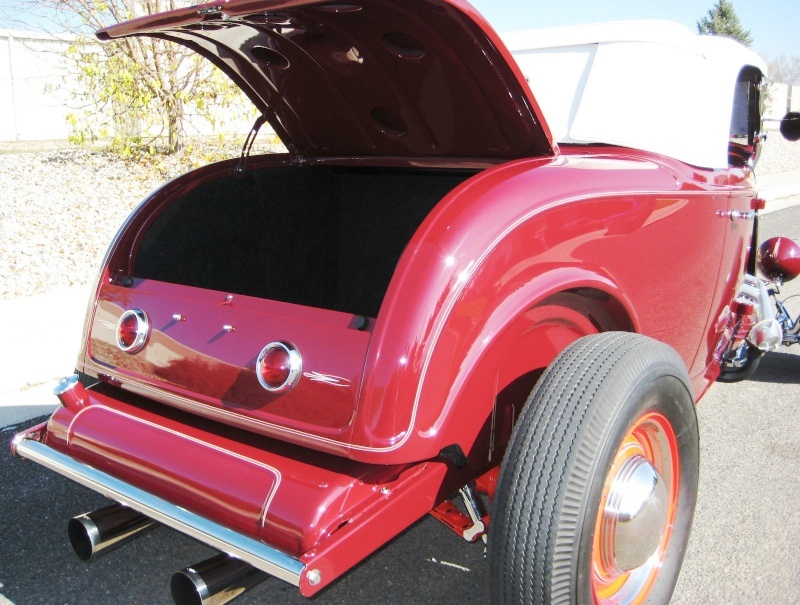 A hood with open sides is a traditional hot rod look, but check out the smoothed radiator shell and Pontiac taillights that give it a slightly different look from all the others that you see at shows. 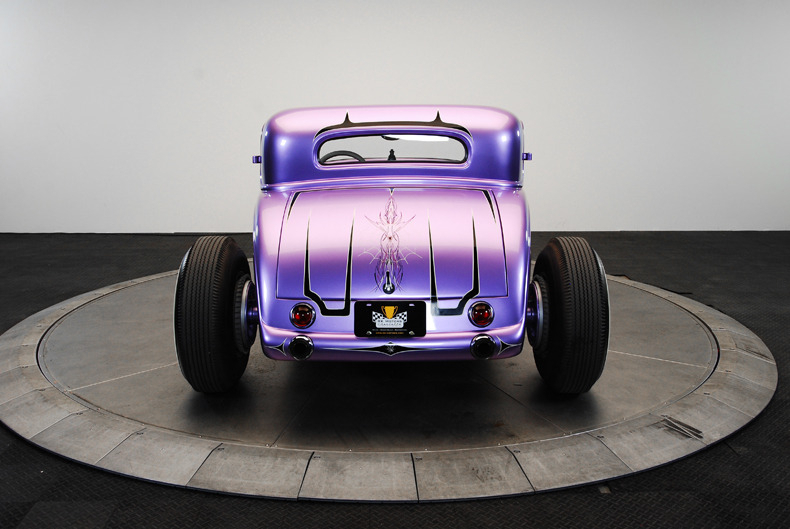 Full fenders make it less radical than a hi-boy, but the stance and rolling stock leave no doubt that this Deuce was built for speed. 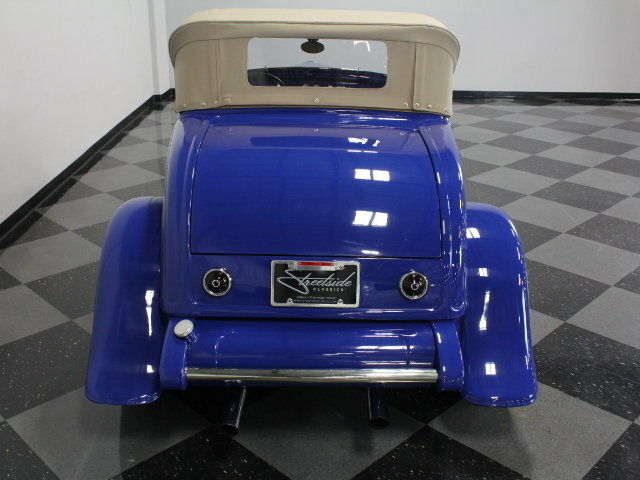 The blue paint shines up beautifully and isn't marred by unnecessary graphics or stripes, just a clean roadster that makes a great first impression. Also be sure to check out those trick headlights, which feature integral turn signals that are a super clean way to add safety without add-on fixtures. Nice! 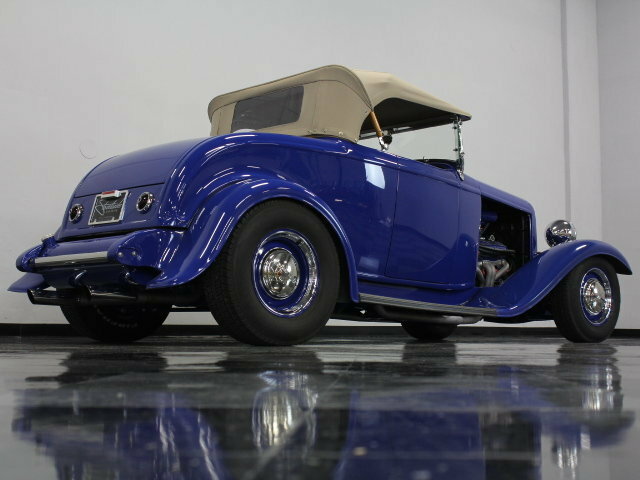 Ford roadsters were typically minimalist cars, but this one got a big dose of luxury inside where there's a wide leather seat, plush carpets, and a few upgrades that make cruising a pleasure. 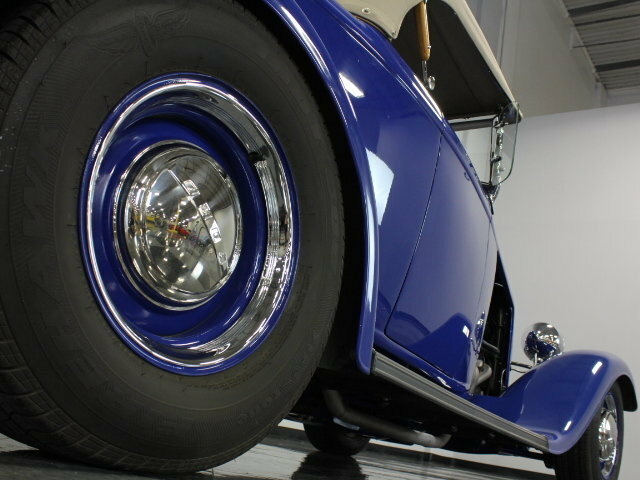 A tilt wheel with a banjo-style wheel makes getting in easier than any stock '32 roadster and still looks suitably old school. 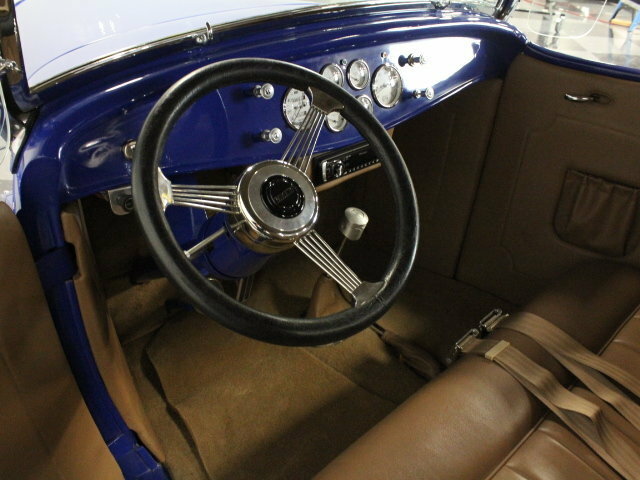 The instrument panel was covered in matching blue paint and filled with attractive white-faced gauges from Auto Meter. A neat little pod under the dash holds an AM/FM/CD stereo head unit with speakers cleverly hidden throughout the passenger compartment, and there's even a heater tucked up under there for those chilly nights where you just can't bear to put the top up. 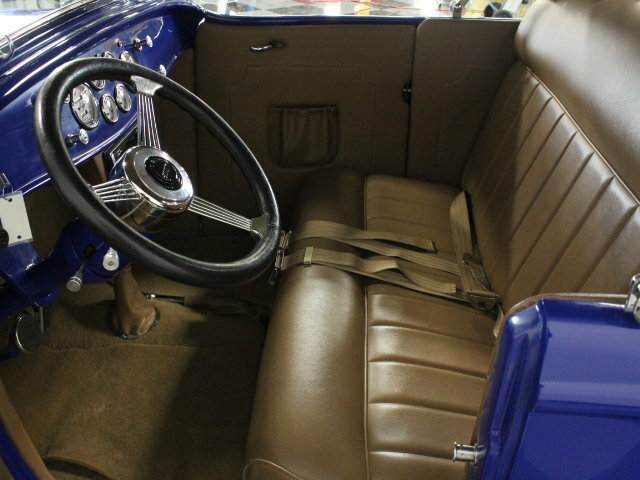 A cool Lokar shifter looks like an aluminum piston and matches the billet pedals, and seat belts have been added for safety. 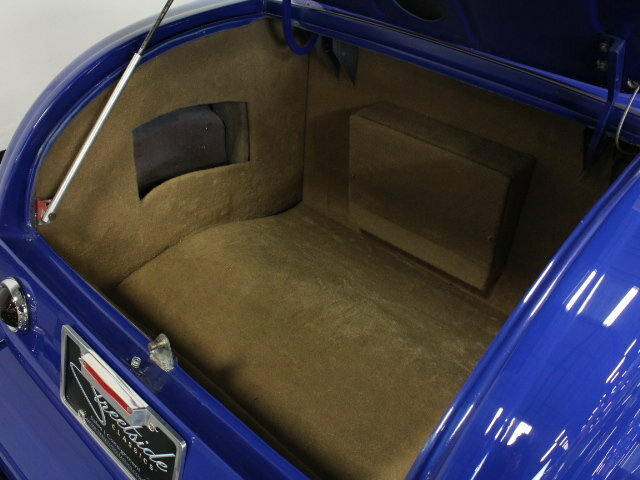 The trunk is surprisingly roomy and nicely upholstered, offering a few storage cubbys for extra gear and the tan convertible top has a subtle chop yet keeps its original profile. 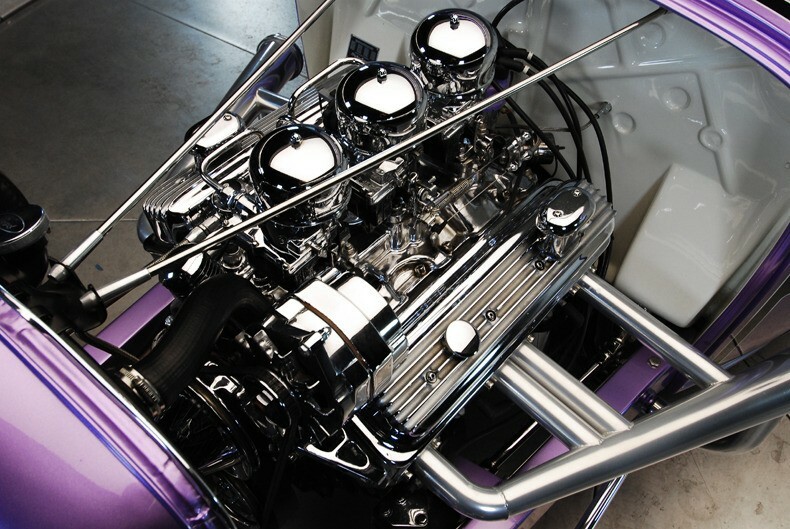 Power is by a traditional small block Chevy V8 linked to a TH350 3-speed automatic transmission. Nothing radical, but the sound and the performance, not to mention the reliability, will make you a believer in keeping things simple. 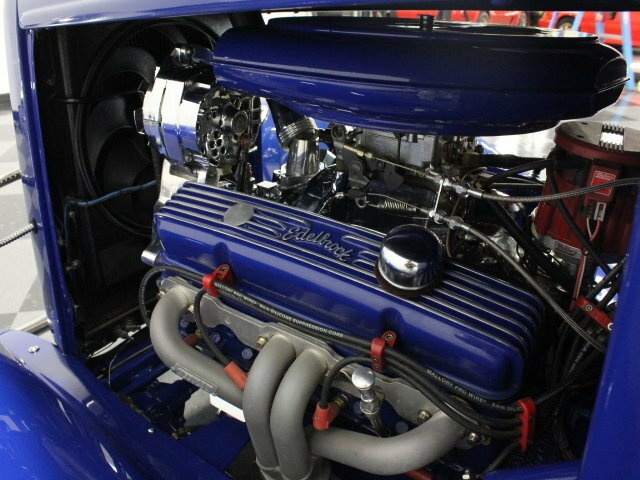 Edelbrock supplied not only the valve covers (color matched to the body), but also the carb and intake, and it all lives under an air cleaner taken from a 1954 Cadillac. With open hood sides, extra care went into the detailing of the engine, with form following function and craftsmanship taking center stage. The TCI chassis features coil-overs all around, with an independent front suspension and a 9-inch rear out back. 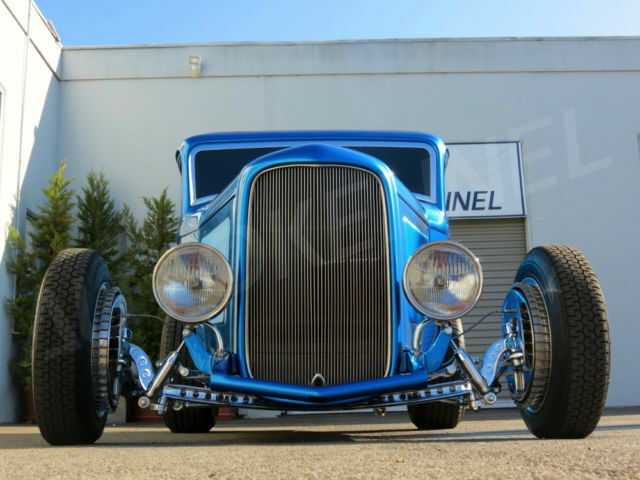 Take your time looking around underneath, because there's lots of trick engineering, although the Wheel Vintiques steelies and Firestone radials have a very low-tech look that's perfect for this Ford. 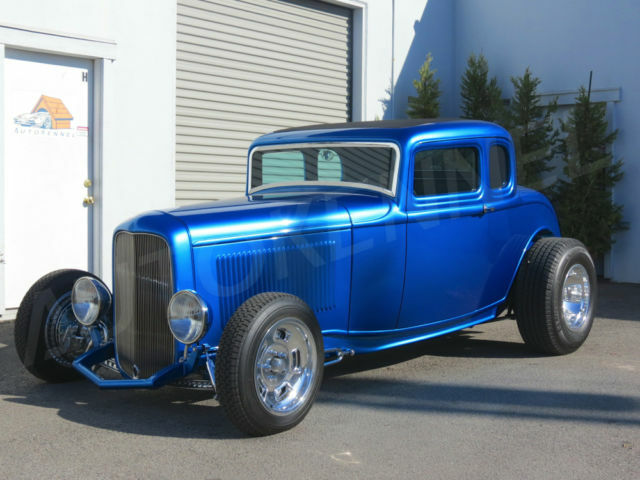 Beautifully built and cleverly engineered, this wonderful '32 Ford is the car you've always dreamed of owning but never quite found the time and money to build yourself. Why wait? Now is the time, so call today! 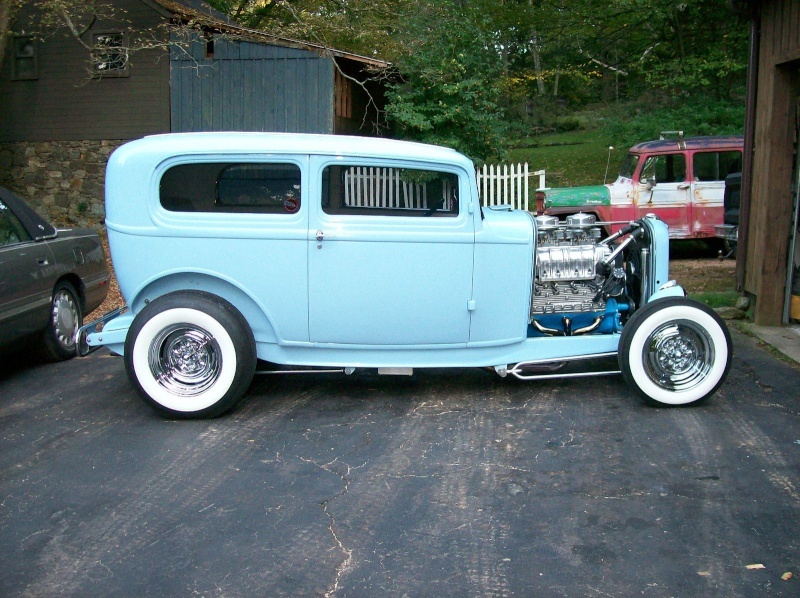 Here is my original steel matching frame and body 1932 Ford sedan. 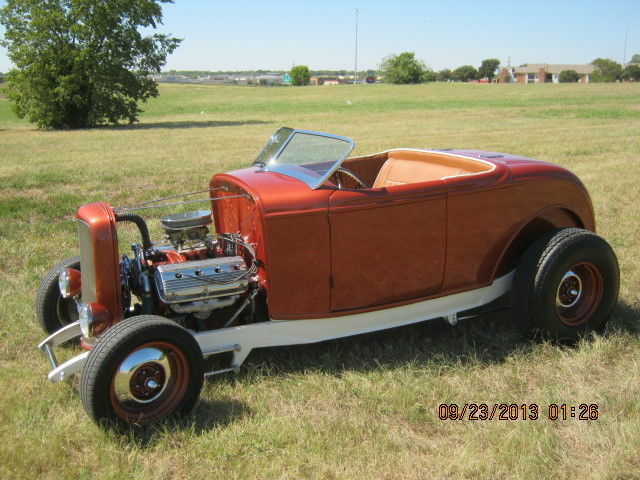 276 flathead with T5 5speed. 9" ford with 310 gears. This car has been in many mags. and has won all kinds of awards. It has been cross country with not one issue. 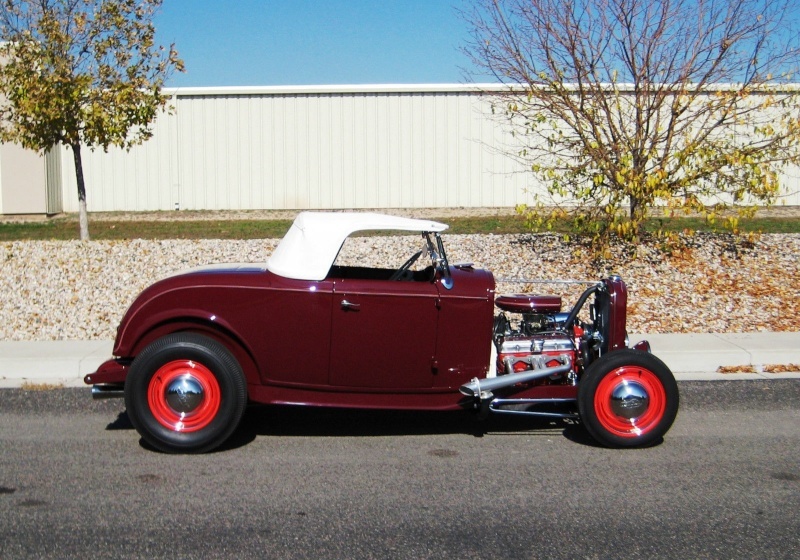 I built this car from a rust free Model B about 15 years ago. I will scan the build info and all the tech info later today along with many pictures. This is a 100% sorted car. 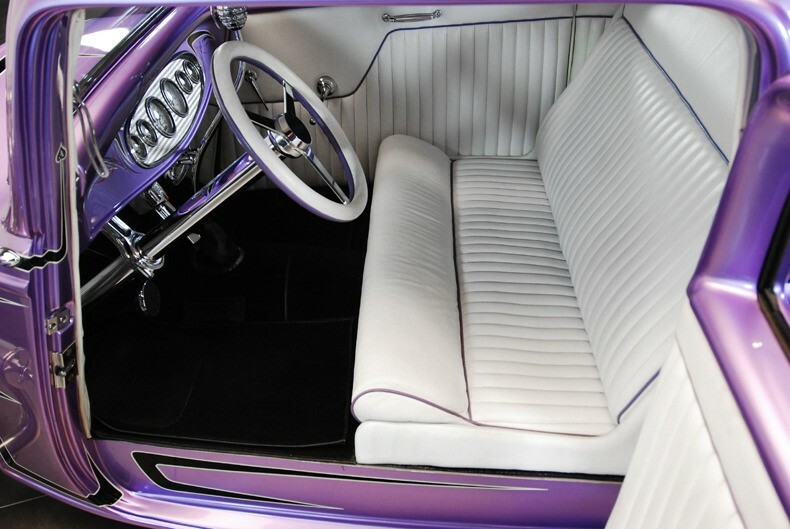 I would jump in and drive this anywhere today. ( the rear tires need to be changed as they are getting a little hard) I will put on new tires of buyers choice. 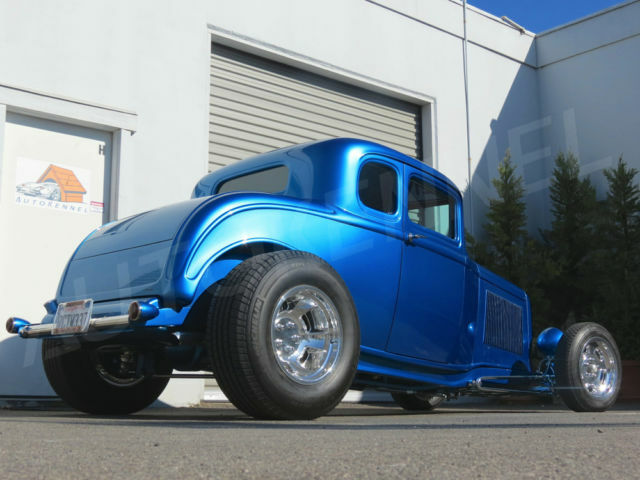 This Ford sedan is not cheap, but all the custom fabrication on the drive train and chassis is proven and tested. The motor and blower have just been gone over and new bearing installed in the blower. 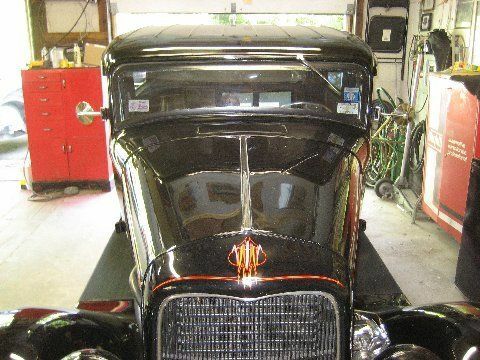 I have the original hood and sides and a custom air cleaner that clears the hood. I am running a Mallory YZ dist. now with a Pertonix. The Mag is avalible too. 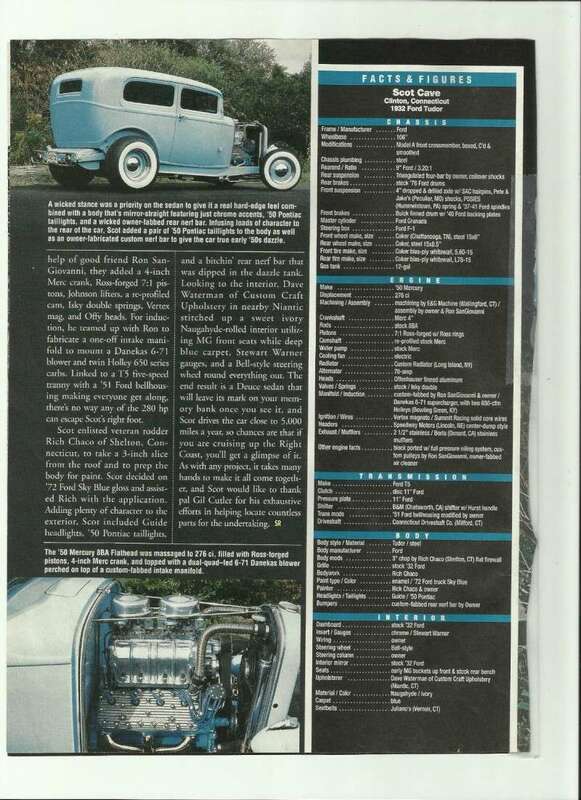 Check out the feature from Street Rodder mag for all the tech stuff. If you need pictures of the underside pls. message me and I will take some. The underside is removeable floor boards that are covered in stainless steel. The exhaust is stainless, with stainless Borla mufflers. Horse power is around 300 getting 18 MPG. She cruises 75mph at 2K. 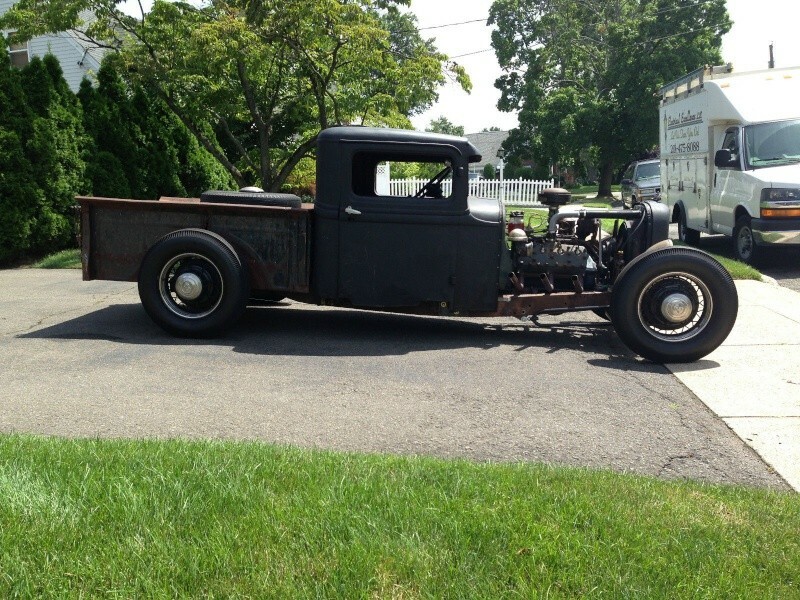 I would change the rear gear to 350's with the .76 overdrive. When I sent the preliminary photos of this car to our editor for feature approval, his immediate response was yes, but with a question attached. 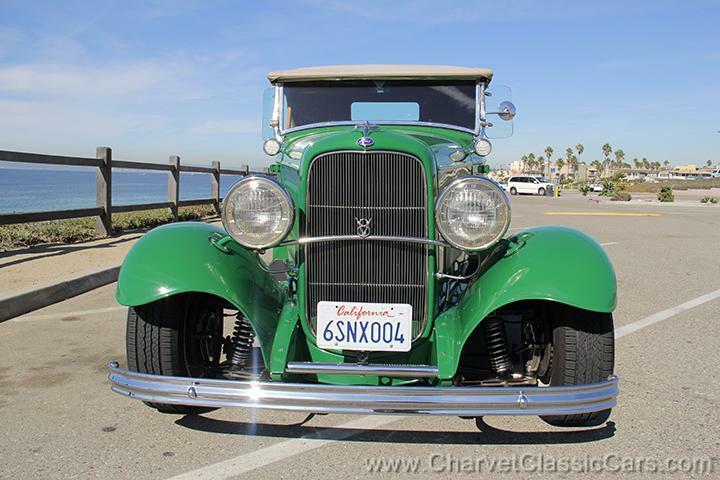 Kevin wondered, almost as though he were thinking out loud, why so many of the cool '32s were black. Well I really didn't have an answer, I'd never really thought about it. 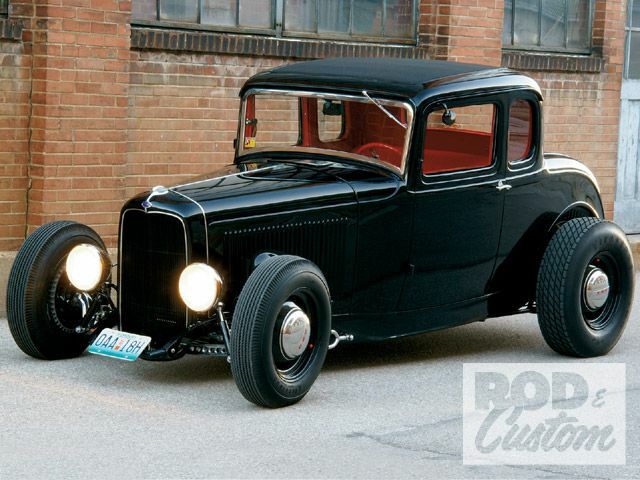 Serious hot rods are black; that's what we have come to expect. It's a tradition dating back to the beginning of the movement. I personally like to think it has something to do with our image of the bad boy delinquent terrorizing the streets in his fast, loud, evil machine--women and children scurrying for cover while black-and-white police cars with single red flashing lights on the top attempt to maintain order so law-abiding citizens can be safe on the streets. In other words, it's the old movie stereotype that plays in our heads. Or it could be that most of the old cars that young men of the time were able to buy were black and performance parts were more important than new paint. I personally prefer the first explanation, but to each his own. 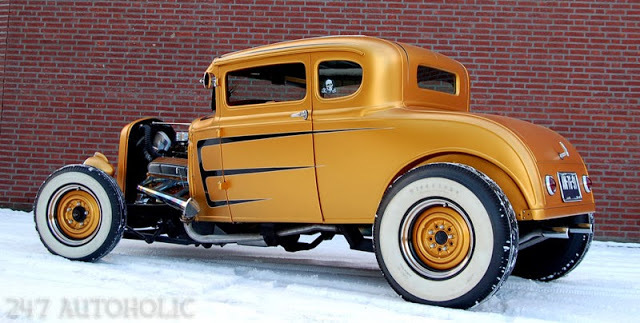 Now that I've managed to not really answer the original question, let's get on with the real story about this black '32. As I'm sure you've noticed, it doesn't matter what a dedicated car guy is doing or where he is, he's always looking for the next hot setup, the next trick piece, or the next great project. By nature he is full of plans and generally has a list of potential projects that will outlive him by decades. The upside of all this dreaming and scheming is that when something comes along he will, without hesitation, jump on it because he has a plan. Case in point, Jerry Eckholdt and his good friend Don Albers took a little time out to attend the Chili Bowl Midget Races in Tulsa in January of 1999. 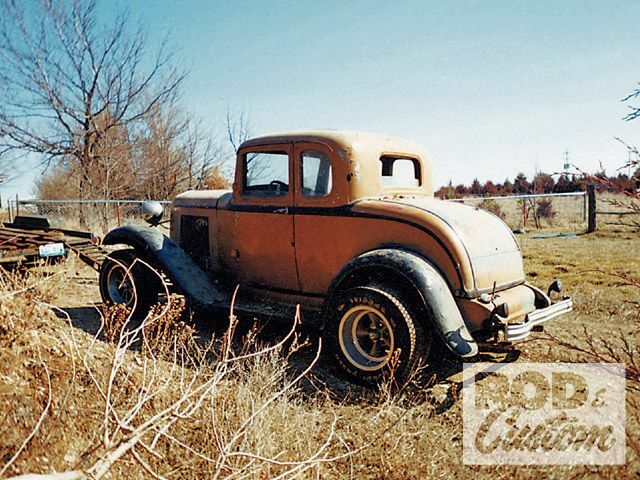 During a lull in the action they struck up a conversation with a gentleman in the stands who claimed to have a variety of cars on his Oklahoma property. 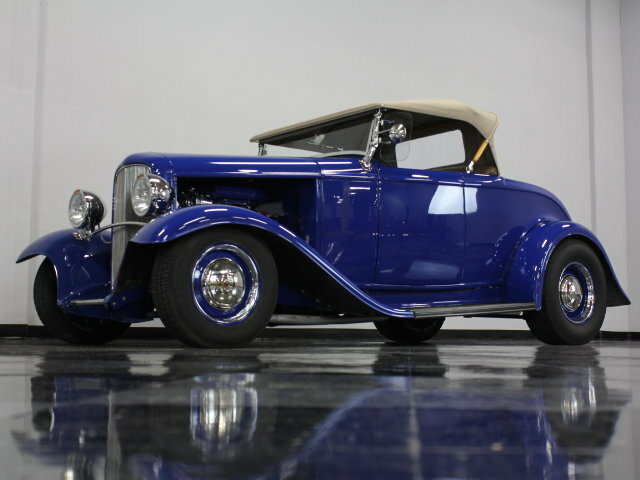 As the conversation progressed from the cars he had owned to the ones he still had and the ones he would be willing to part with, an uncut full-fendered '32 five-window was mentioned. At that point Jerry, who had been idling through most of the conversation, got completely engaged. You see, he had been building a five-window Deuce in the back of his mind for years and could suddenly see it all coming together. The mental car was simple, it was basic with a vintage engine and the just-right look, and now it was so close he could almost feel it. Names and phone numbers were exchanged, calls were made, and a short time later Jerry, Don, and Jerry's trailer were on the way to Oklahoma. Jerry describes the property where the car was stored as an amusement park for car guys. Everywhere he looked were engines, engine pieces, bodies, body panels, and suspension pieces--it was a gold mine of hot rod stuff. As they drove through the property they had a running commentary on each item they spotted until they came to the abandoned U-Haul box in a back field that had been home to the '32 for the past 15 years. Even at 50 feet Jerry could tell from what he could see that it was a pretty nice car, and was even more impressed when they pulled it out of the box. 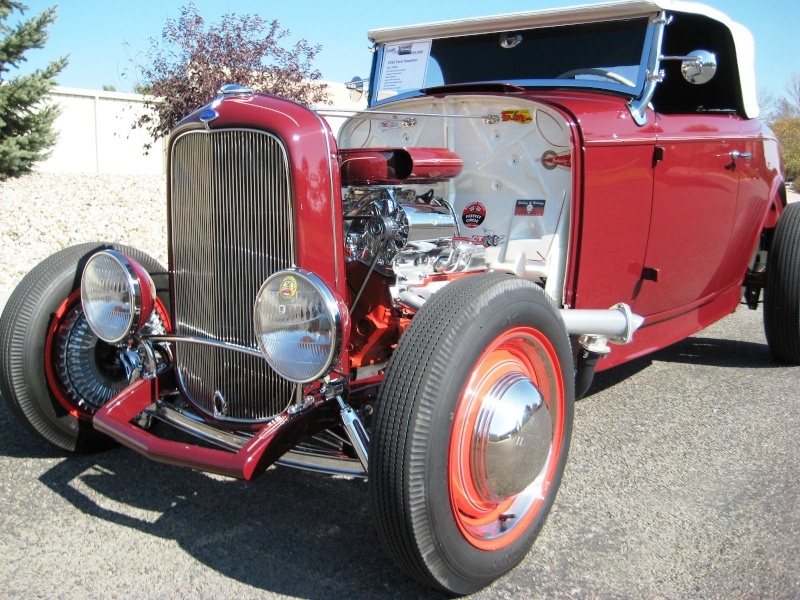 It was a '60s hot rod powered by a 289 backed by a four-speed and, as Jerry says, very crude by today's standards. 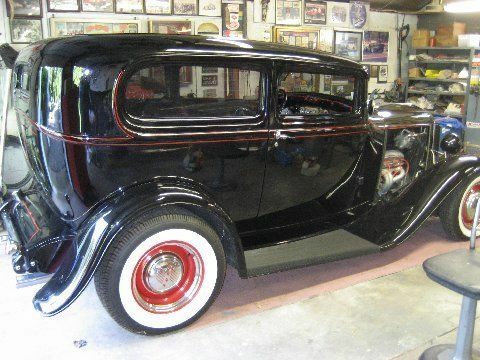 Sure there were a couple of nickel-size rust spots on the body, another on the trunk floor, and a few minor dents, but it was the real deal--an all-steel '32 that needed almost no bodywork, just strip the paint (there were 11 coats) and have your way with it. Jerry could hardly make the deal, load the car, and be on his way fast enough. 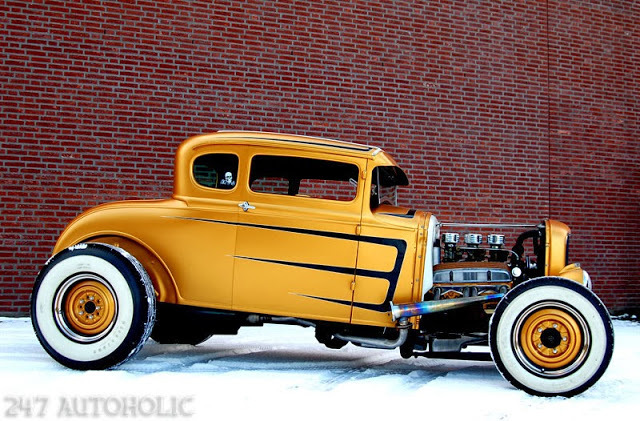 As he headed east all the plans he had for the car simmered until all that remained was the pure essence of a '32 Ford five-window hot rod. 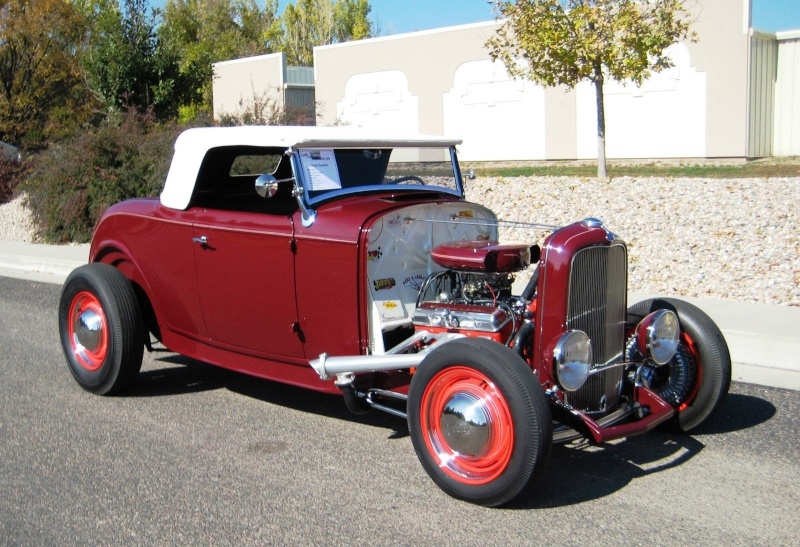 By the time he got the car back to his shop he had built it in his head at least twice. That was the easy part; in reality it took three years to complete the project. Sure, some of the original design plans got changed along the way, but the basics hung right in there to the end. 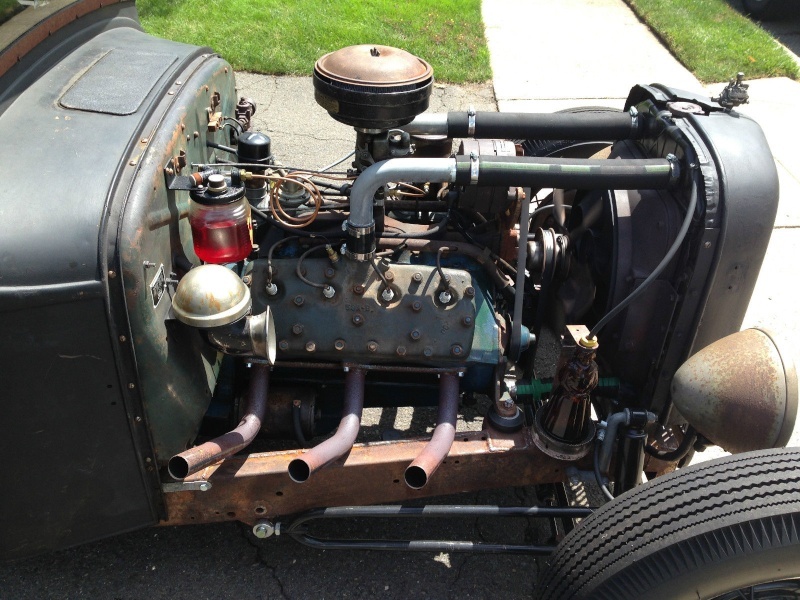 The car is black, fenderless, and powered by an early Hemi with a Richmond five-speed behind it. 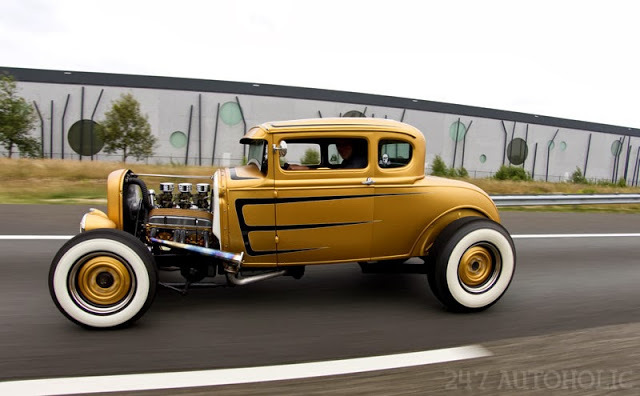 It is exactly the car he set out to build and he is having the time of his life running it up and down the road. So what do you do when one of the projects you've planned for years is complete? Simple. 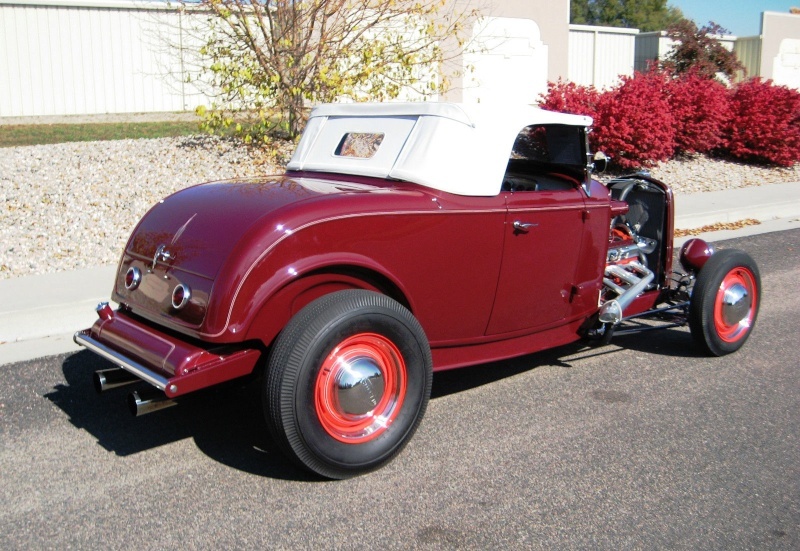 If you're Jerry Eckholdt, you start on the next project that you've planned for years. 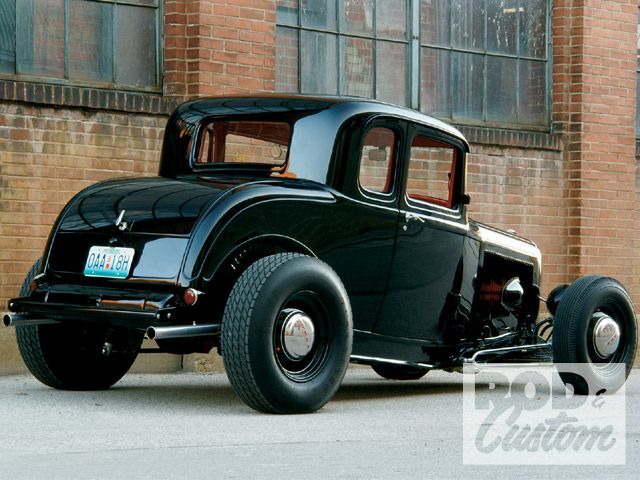 This time it's a Buick-powered '33 three-window with a quick-change. 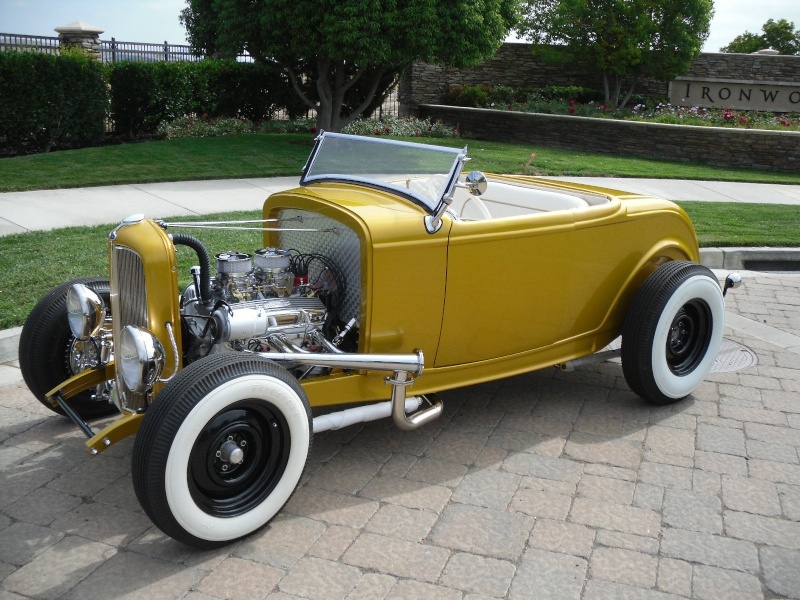 To get the project started, Jerry selected a new chassis from Hot Rods & Custom Stuff (Escondido, CA), which featured a wheelbase stretched 3 inches to accommodate engine installation, 'rails arched to lower the stance, and Hemi engine mounts, all as part of the package. 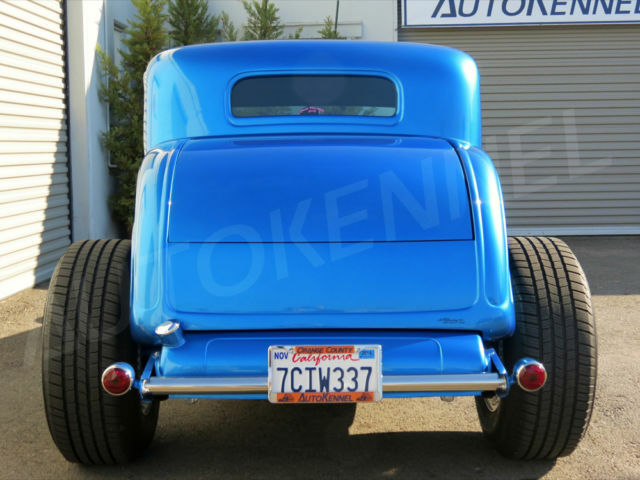 The rear suspension is a triangulated four-bar setup with Aldan coilover shocks attached to a 3.00:1 '57 Ford 9-inch with stock drum brakes. 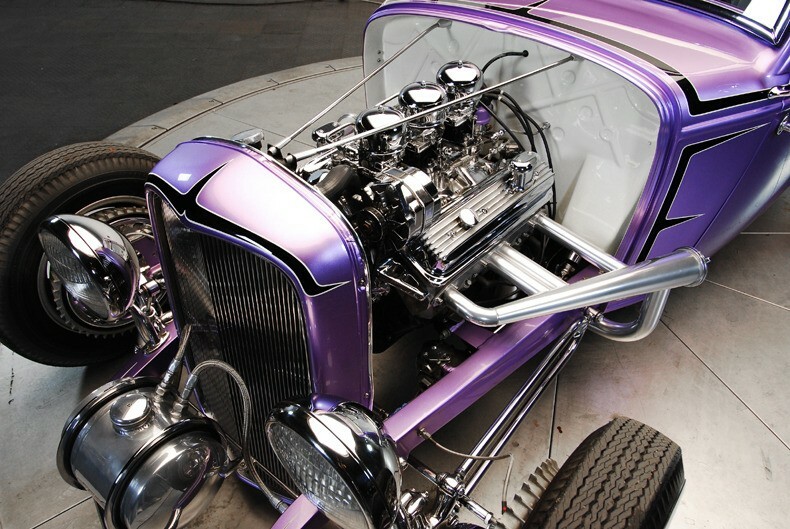 Up front, a Chassis Engineering 4-inch dropped I-beam attaches to the frame with Hot Rods & Custom Stuff hairpins. 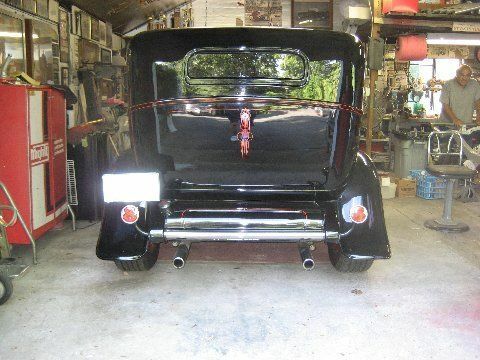 Both ends of the I-beam are capped with '39 Ford spindles, '39 Lincoln backing plates, and Buick-style drums. 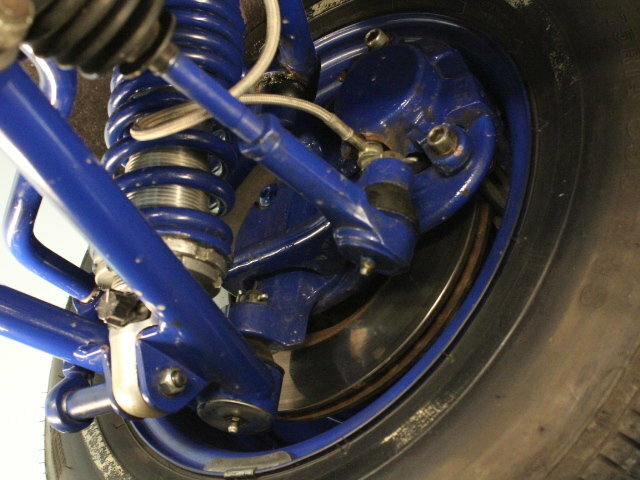 Vega steering controls the direction while bumps are smoothed by a Posies spring and a pair of So-Cal shocks. 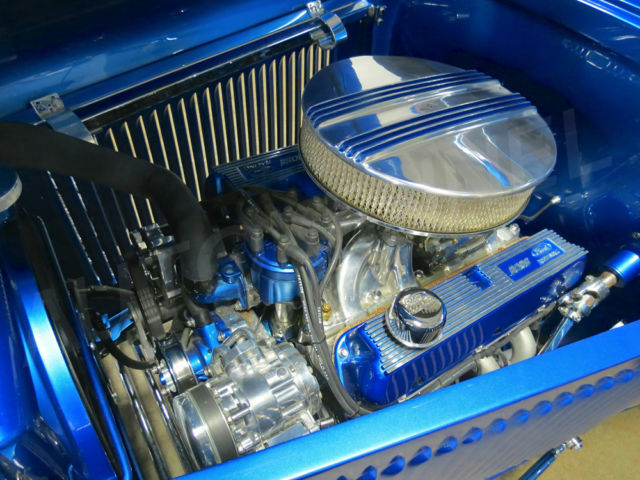 The only power choice possible in Jerry's eyes was a vintage Hemi, so he located a 354 Dodge truck engine and dropped it off at AMT Performance in St. Louis where it was fully machined and fitted with an array of internal performance parts. 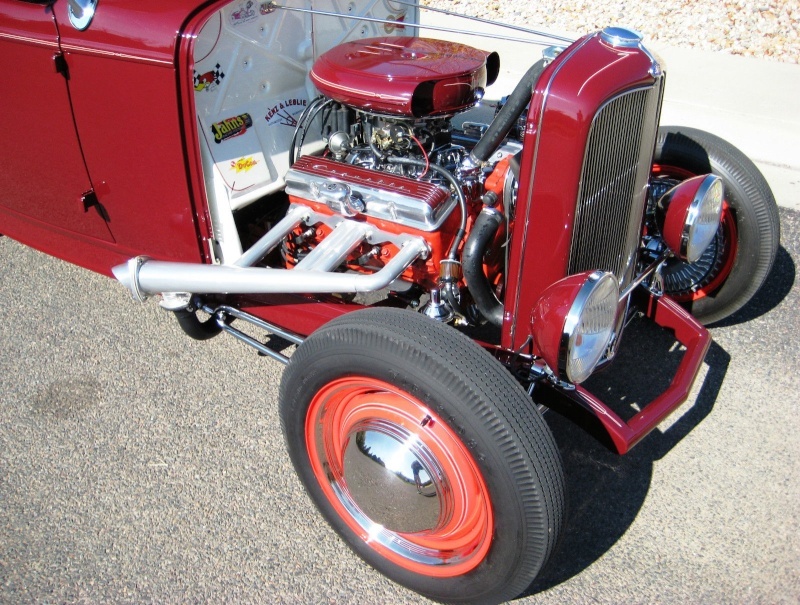 Jerry added a pair of Edelbrock 500-cfm carbs on a Weiand manifold, some nicely trimmed steel Fire Power rocker covers, a pair of homebuilt custom headers, and an MSD ignition system. 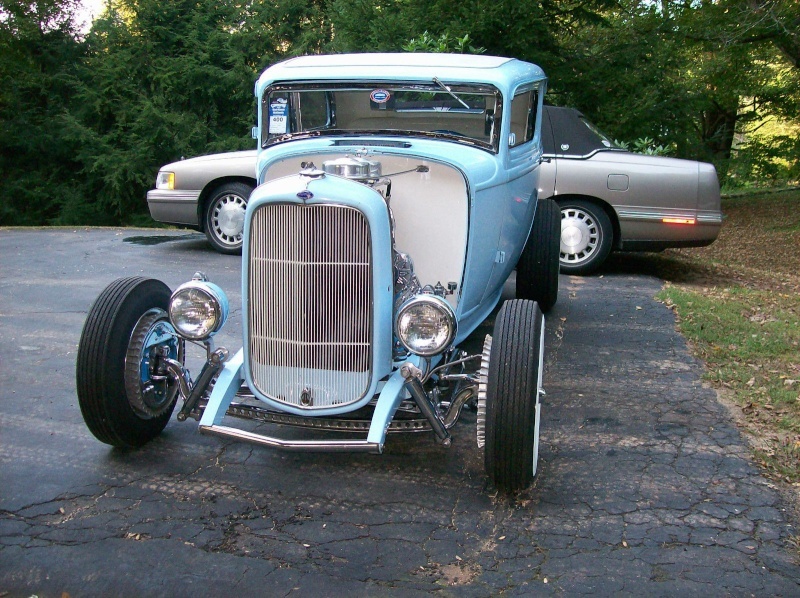 To get the power to the rear wheels, Jerry adapted a Richmond five-speed to the back of the Hemi and the drivetrain was complete. Vintage look, modern tech, reliable power--how much better could it possibly get? 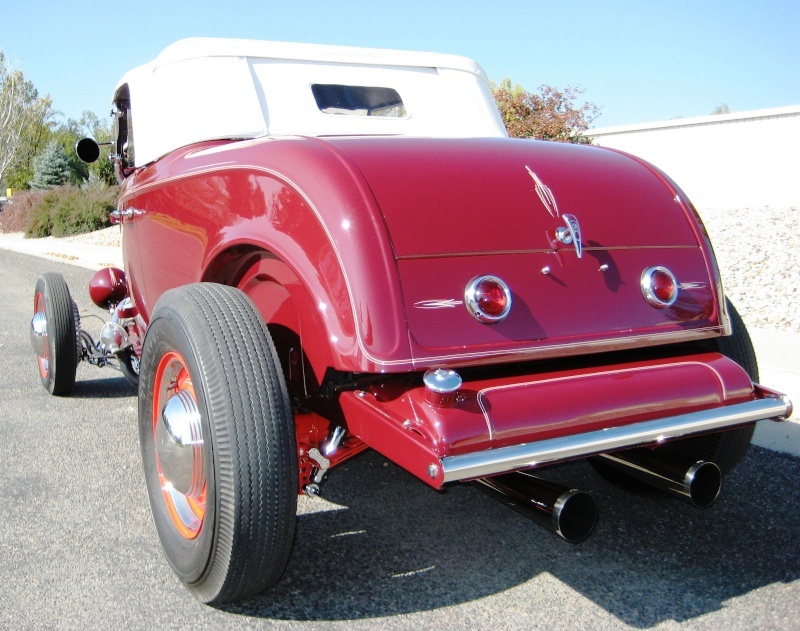 To really nail the vintage hot rod look, Jerry started with a pair of 16-inch Stockton wheels, then wrapped them with 6.00 bias-ply Firestones up front and 7.90 dirt track bias-ply Firestones at the rear. 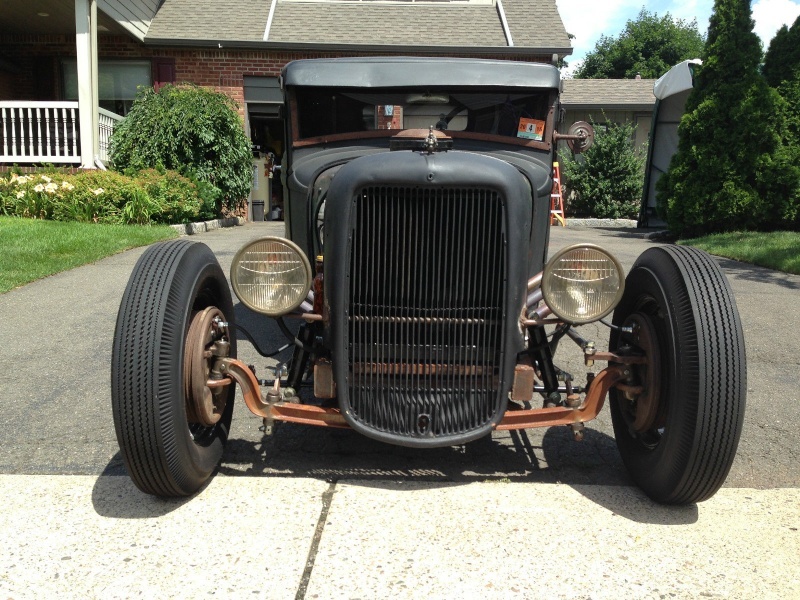 Then to polish the look just a bit more, Jerry added a set of chrome Ford caps to the black steel wheels. 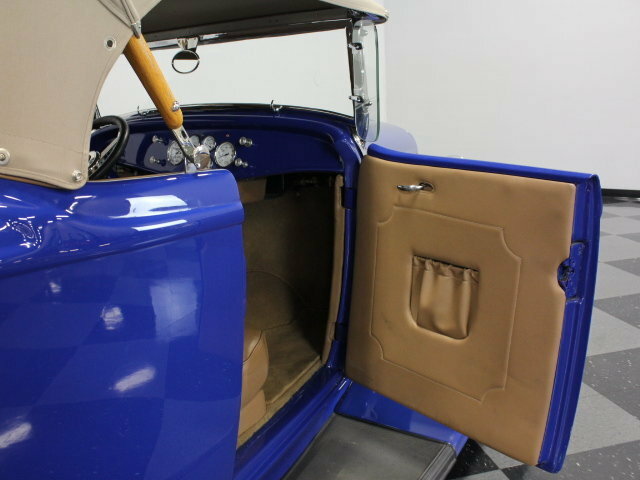 The fact that Jerry started with a pristine body meant that there was very little sheetmetal work necessary; he just had to remove something like 11 layers of old paint and start prepping the metal. Of course, there were decisions to be made. 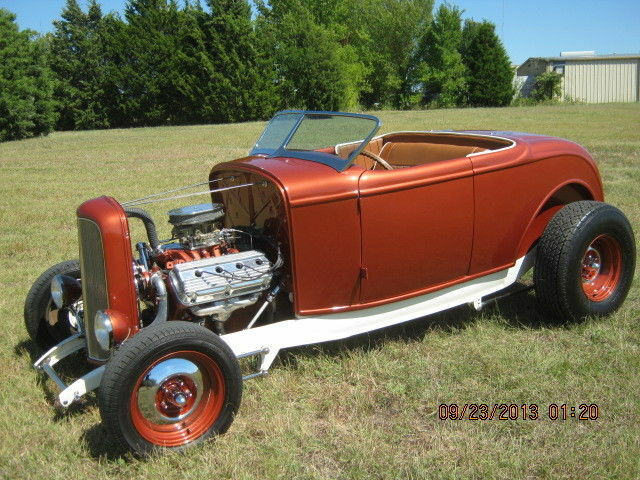 First, should the top be chopped, and second, should there be hood sides? The answer to that was simple: no, the top should not be chopped. That would make it look like all those 'glass cars out there in profile, and that simply was not the look Jerry was after. 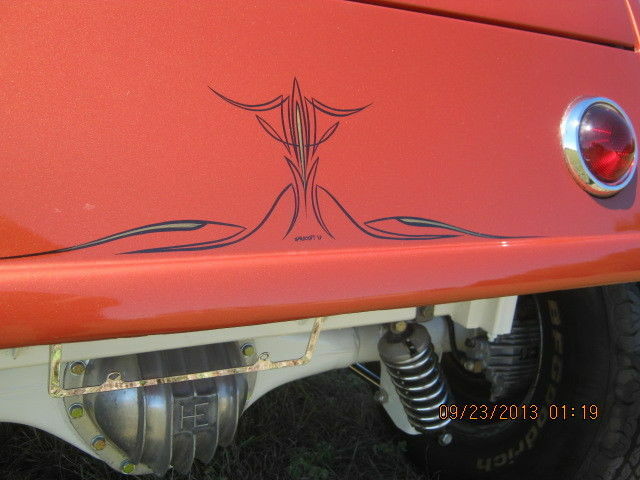 The second was a little more involved, because Jerry decided he wanted hood sides but he wanted louvers, and because of the Hemi there was a hood clearance problem. 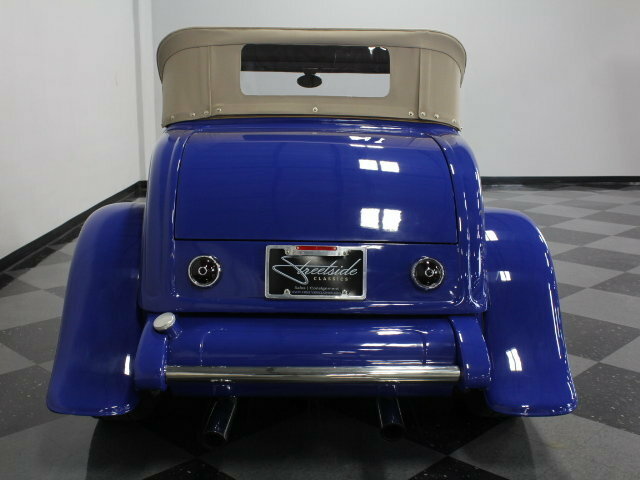 The solution was to use a Rootlieb top and build louvered hood sides with traditional blisters to clear the rocker covers. Sounds simple, but when you choose to hammer the blisters out yourself it takes a little time and a lot of talent. 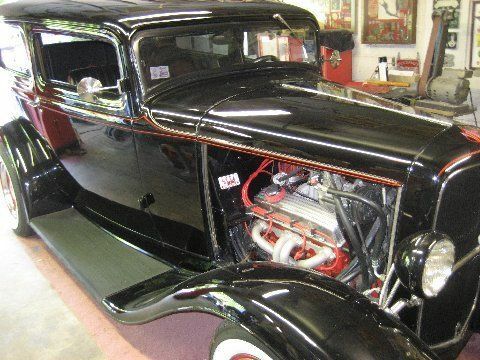 Originally, Jerry painted the car in his home shop, but when it was completed he felt that the car was much better than the paint, so he took it to H&H Auto Body (St. Charles, MO) where Bob Hifill laid down a slick coat of black DuPont single-stage Centari that was a mate to the perfection of the body. 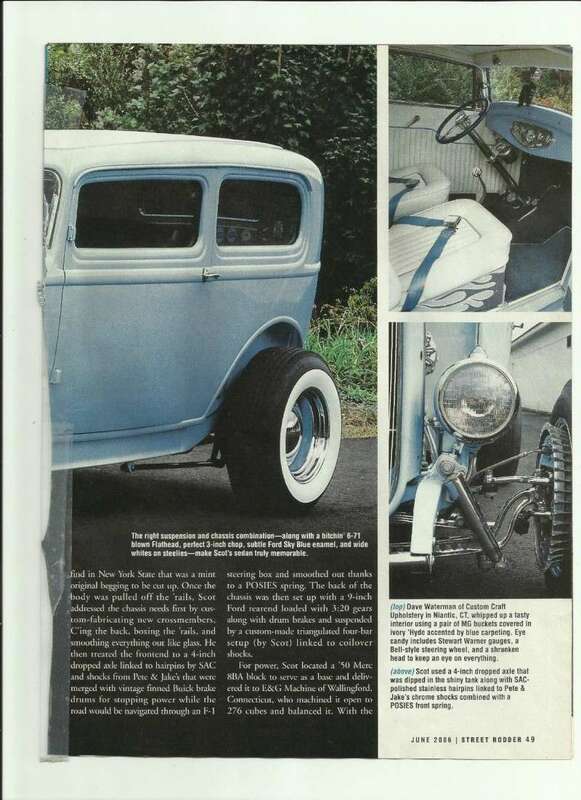 There are other touches: the stock '32 grille, '35 Chevy headlights, and a pair of '37 Ford taillights, not to mention the rear license plate light housing that Jerry fabricated in his shop, the strip of louvers he added to the rear wheelwell openings, and the white firewall with its vintage decals, pinstriped by M.K. John (Montgomery City, MO). 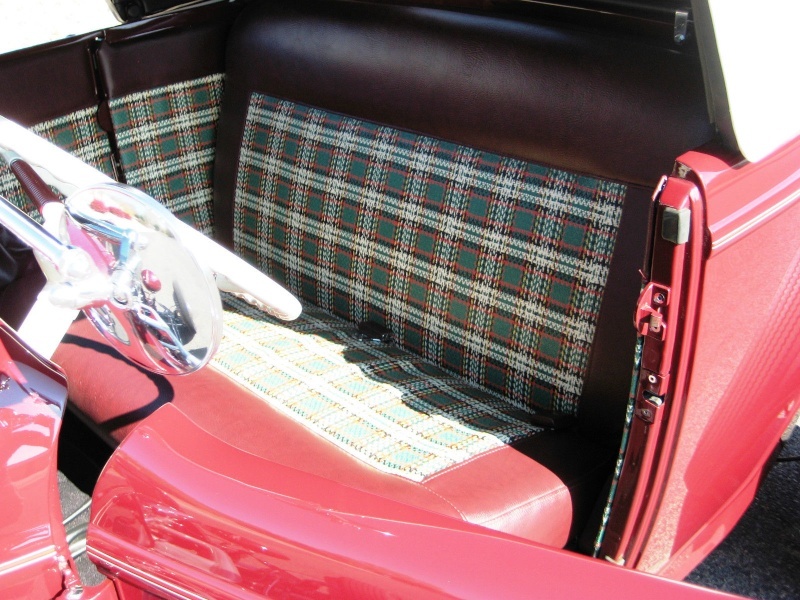 The last guy in is always the upholstery guy, and he is the one who can tie it all together. 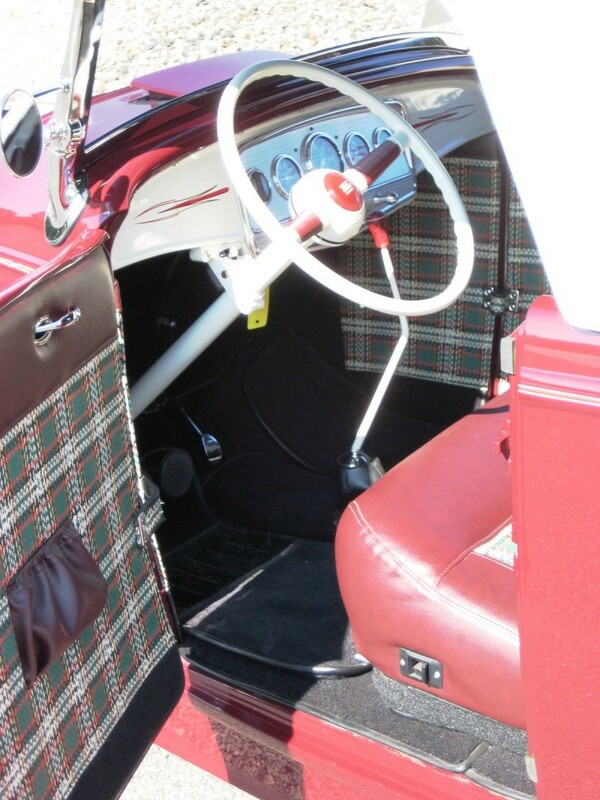 In this case Don Albers (St. Charles, MO) was the guy to really bring it together by installing a beautifully executed traditional lipstick red rolled vinyl interior. 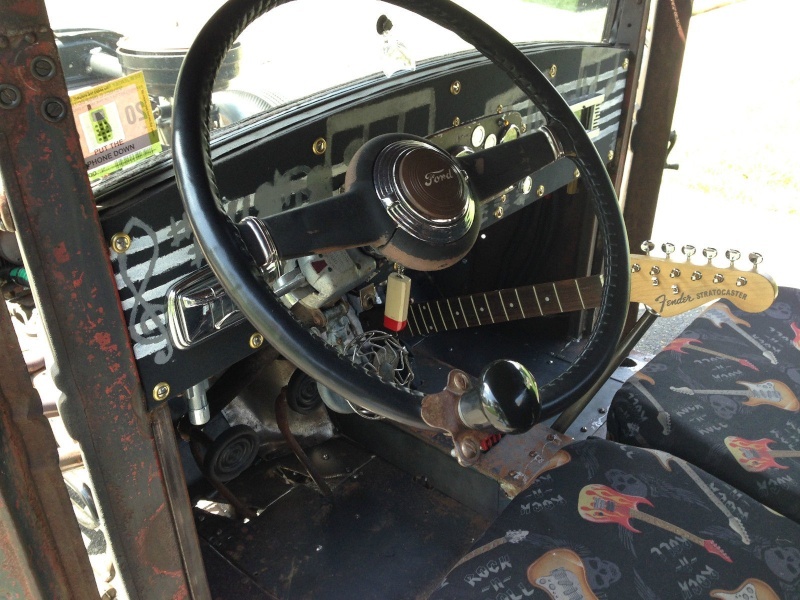 Jerry filled the instrument panel with VDO instruments and added a glovebox to the passenger side of the dash. After painting it red, he had M.K. John lay down more really cool old-school pinstripes. 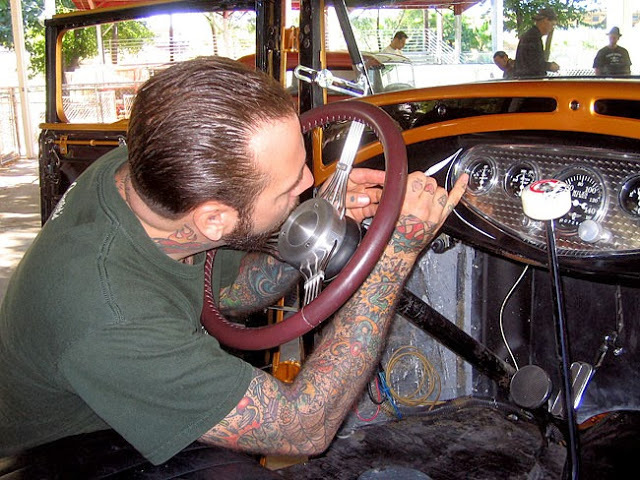 Then there's the owner-modified '39 Ford banjo steering wheel he gets to wrap his fingers around every time he gets in the car. 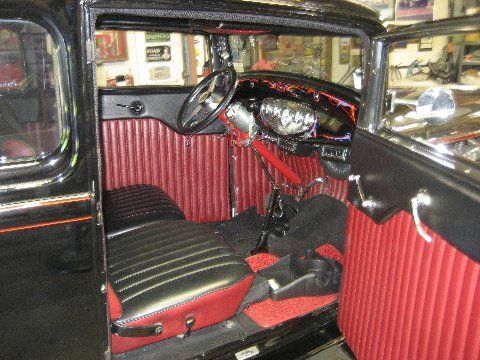 This is a 1932 cab mounted on a 1941 frame. 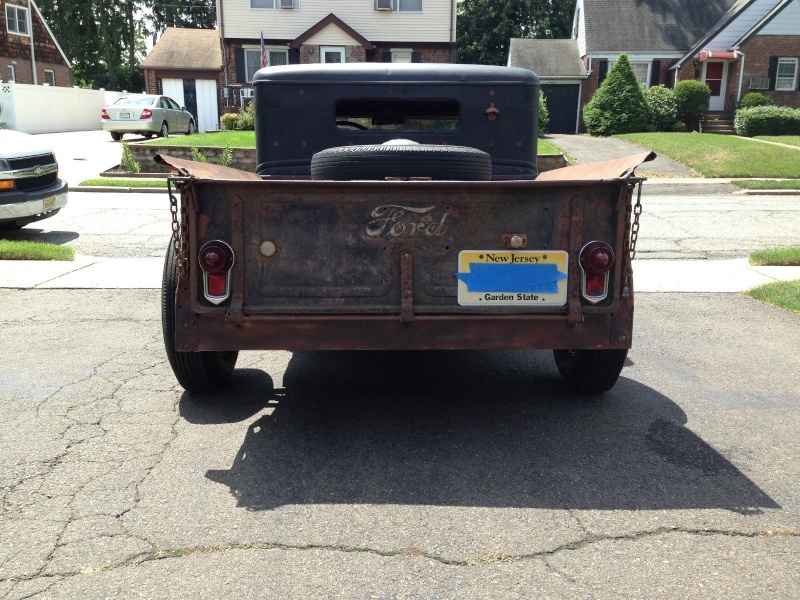 The truck has a clear New Jersey title in my name with passing inspection. 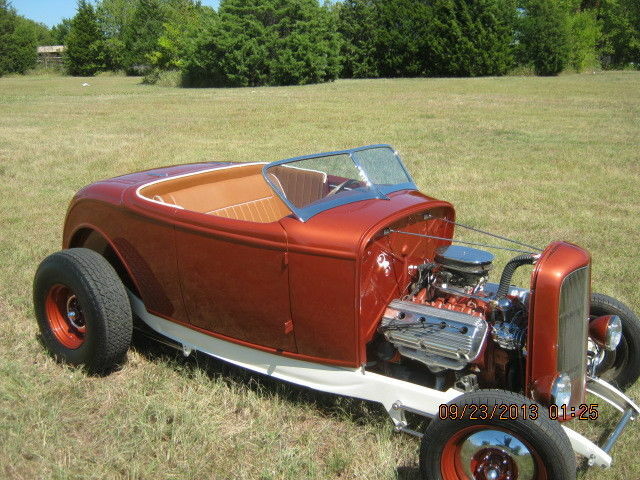 It has a 1946 Flathead with a 4" Merc crank, rebuilt 1934 3spd trans, new clutch and banjo rear with custom torque tube. 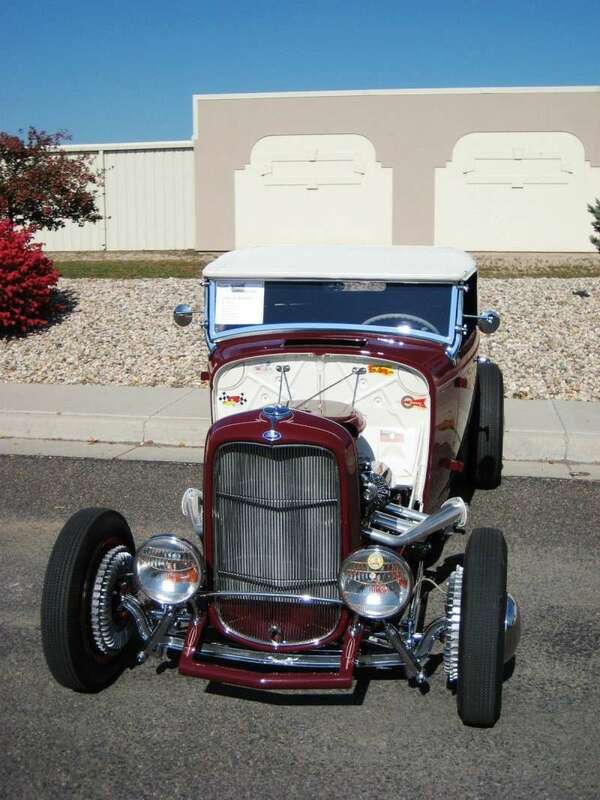 The motor has about 3000 miles on it and was purchased complete & running from a friend. Speedo works.Runs and drives great. 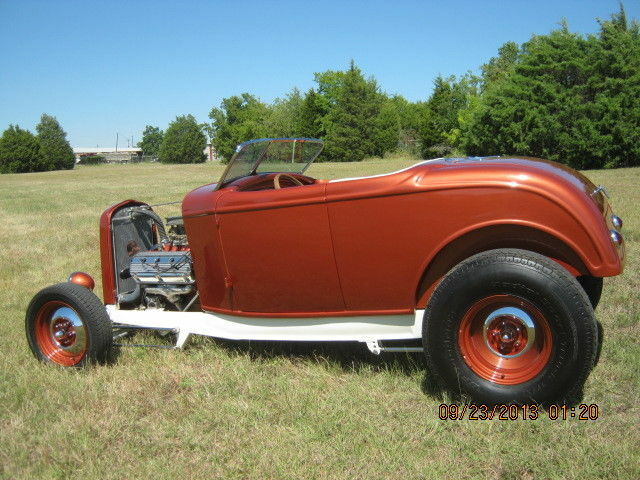 It also has an electric fan and new custom radiator,new wiring harness, full working gauges, gas shocks up front & air shocks in the back.Five new tires with 35 wire wheels, new mustang fuel tank and sender, all new brake & fuel lines. All brake components & wheel bearings are new. It's a ton of fun to drive and steals the show everywhere I take it. Unfortunately, it needs to go to complete another project. I have a box of receipts as well as metal for lower doors, cab corners & cowl bottoms. There are no side or rear windows. 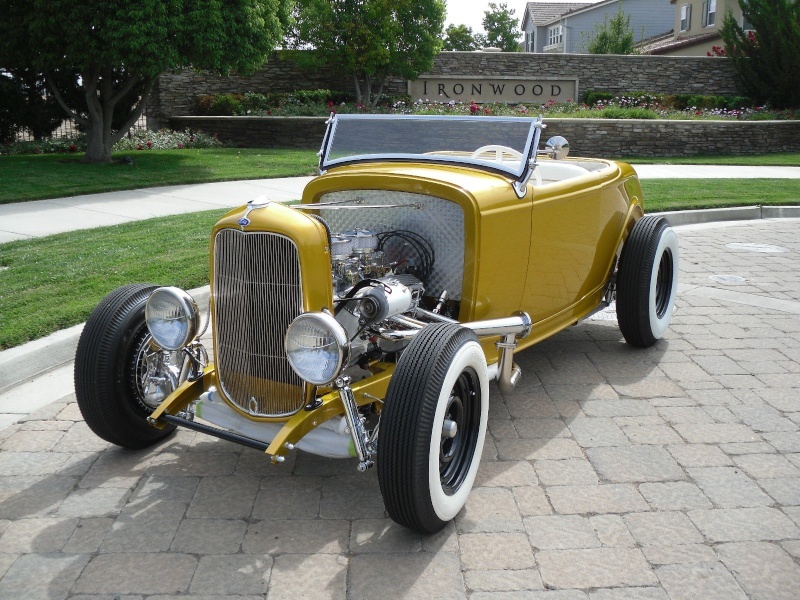 Bobby Alloway has been building timeless hot rods for over 25 years now. 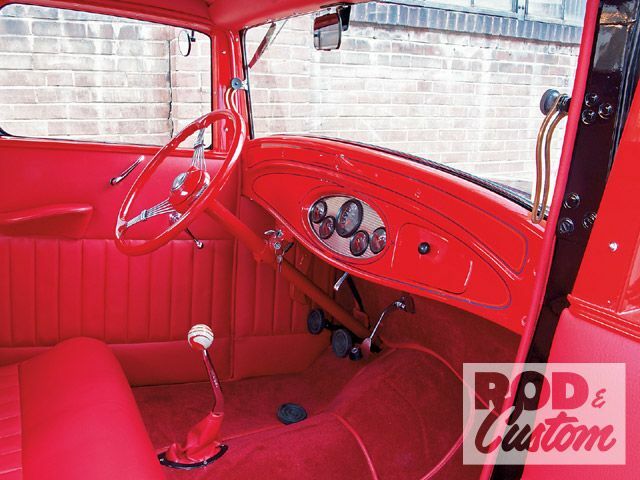 Countless numbers of his cars have been featured in the top hot rod magazines and have gone on to wins some of the most coveted awards in the industry. 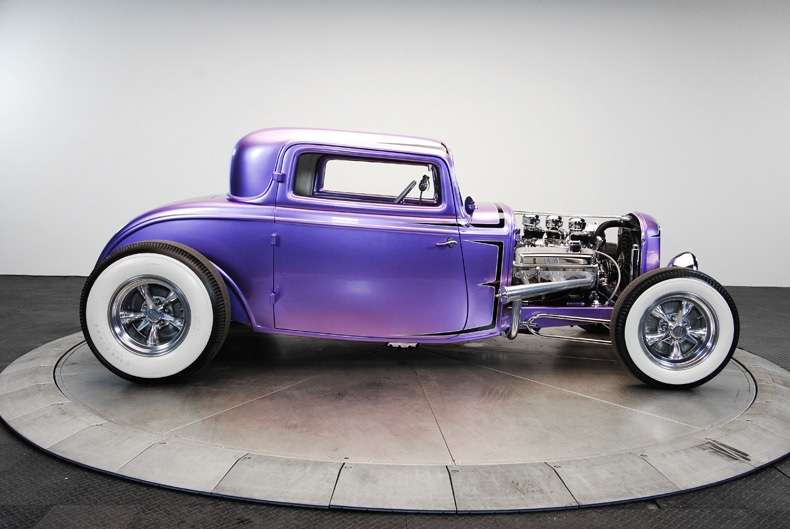 He has built SEMA winning cars for GM and other major manufacturers as well as winning the top price in hot rod building: The Ridler Award. 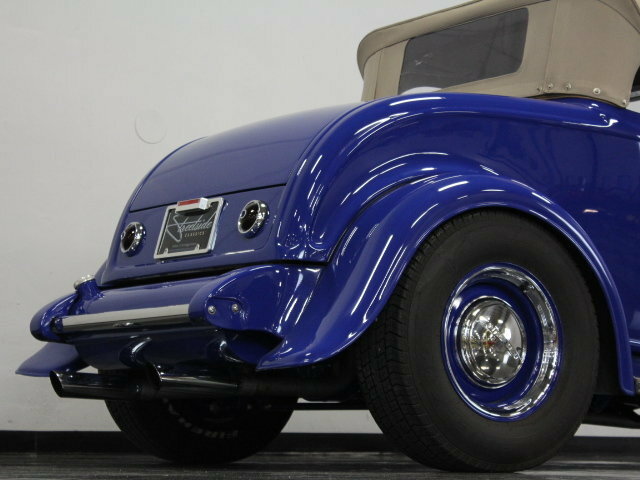 Even the late Boyd Coddington commented on the styling and build quality of Alloway’s work. He simply doesn’t cut any corners and always strives to build the best. The final look of the car is outstanding. 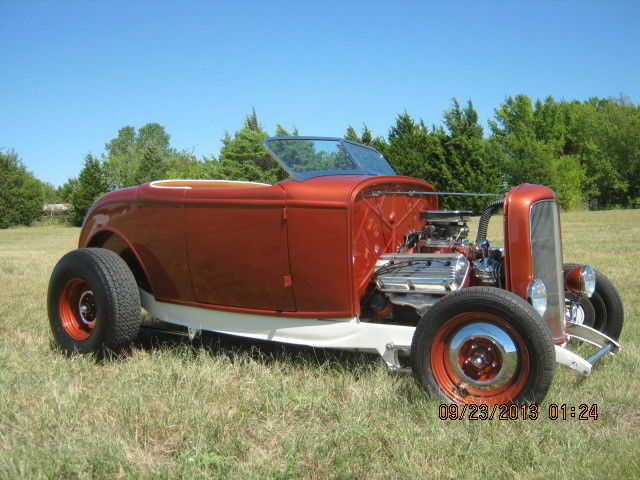 It has just that “right” hotrod look without being to over-the-top and, it has the power/performance to back it up. This isn’t just another one of those “30-minute” hot rods where you can’t stand to be in it after a half hour. This car was built to cruise long distances. The car was finished a couple of years ago. It has only been used for some light cruising and car shows. 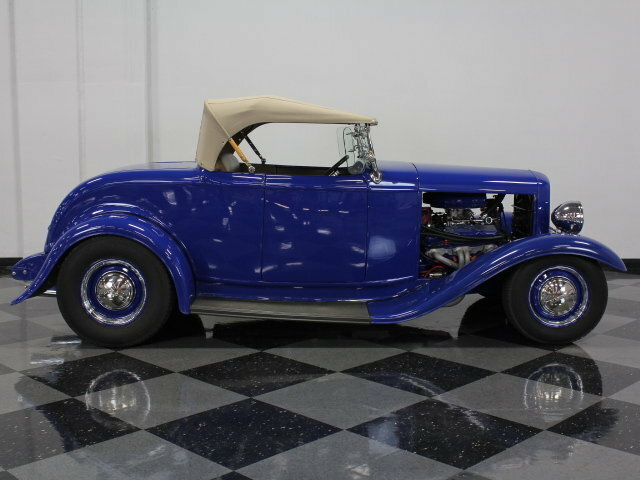 It is in spectacular condition and is ready to go. 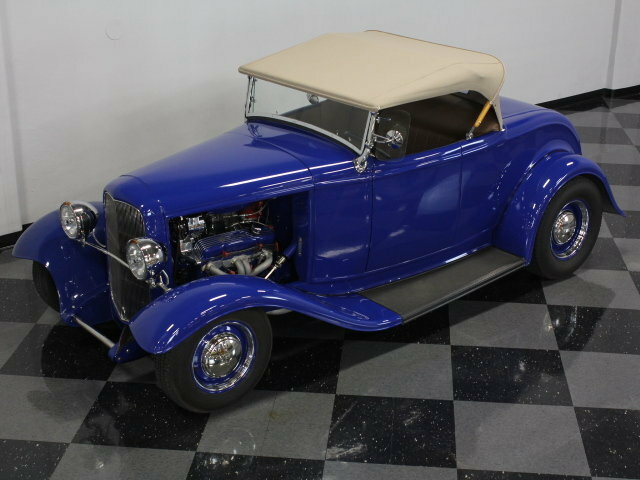 Beautiful 1932 Ford V-8 Rumble Seat Roadster Hot Rod. Professionally built in the 1970's to the highest quality, and recently completely refreshed throughout. 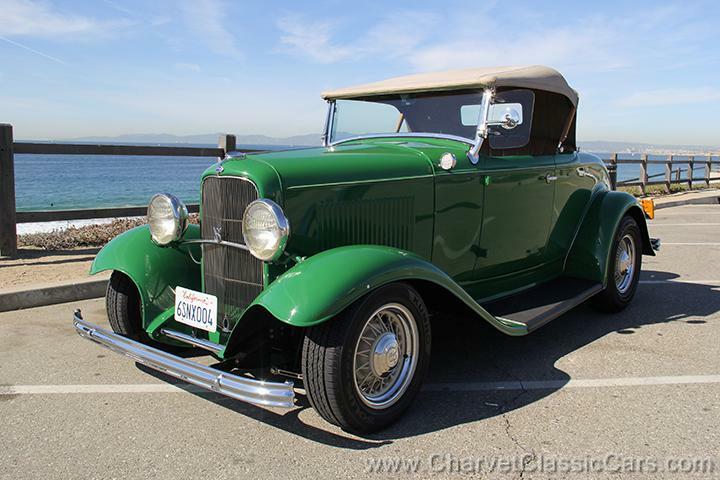 Fiberglass body and fenders (California titled as a 1932 Ford.) Exceptional quality fit and finish. 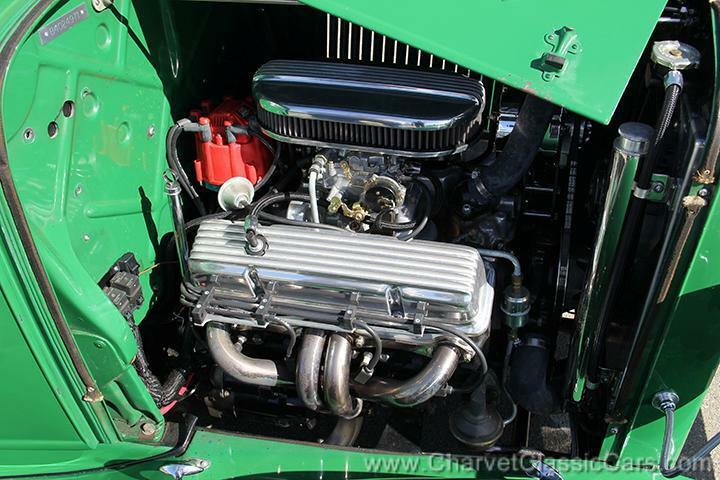 Chevy 350 small block engine. GM automatic transmission. New carburetor. New electronic ignition. New alternator. New battery (12 volt). New wiring. LED tail lights and turn signals. Tilt steering. 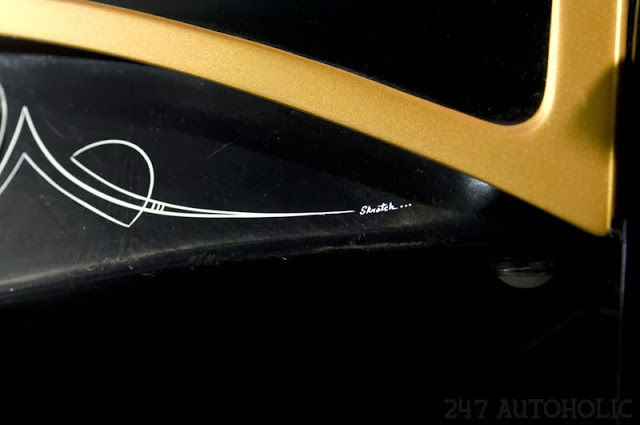 Disc brakes. Coil-over suspension. 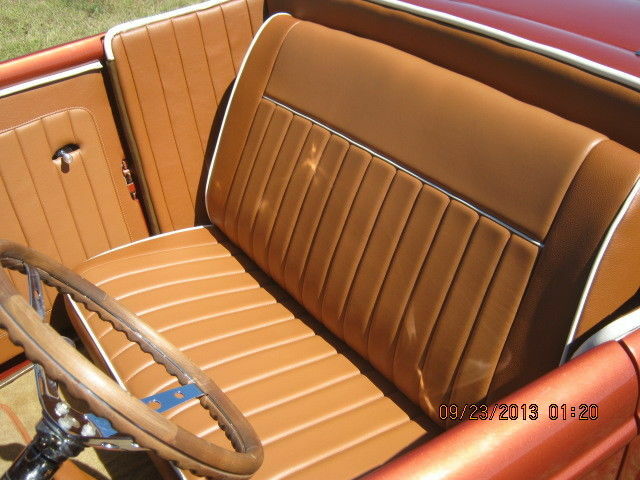 Tan leatherette interior. New carpet. New radial tires. 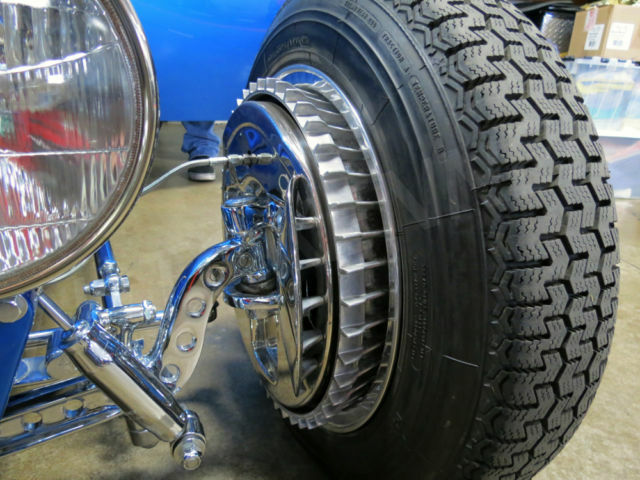 Big 'N Little wire wheels. JUST 7,485 MILES SINCE BUILD. Runs and drives great. Fantastic power and torque. Needs nothing. Must see and drive to appreciate. Excellent fit and finish. 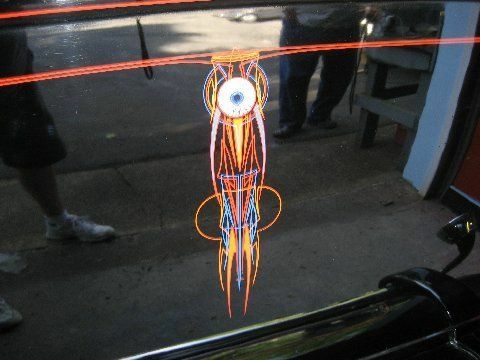 Hand painted pin-striping. Here’s without a doubt the coolest ride I’ve ever owned. 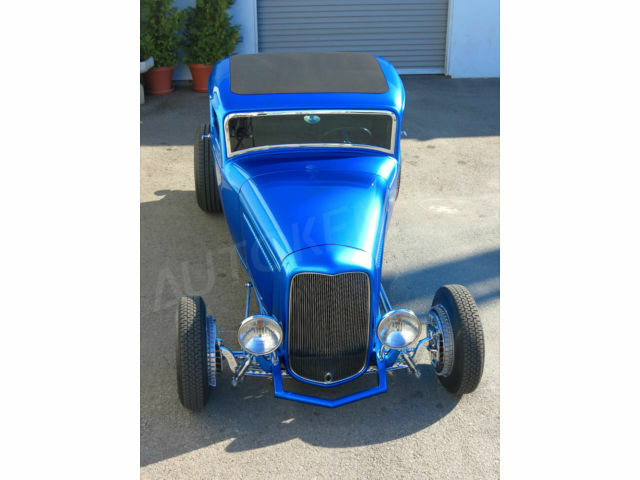 The car was very well known in the Southern California area at the time and appeared in the books “Classic Hot Rods” and “The All- American Hot Rod”. 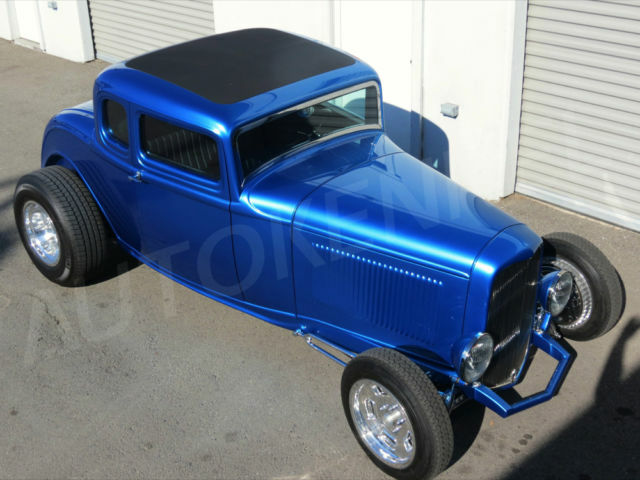 After Buddy decided to sell his ’30 coupe it eventually wound up in Northern California with Pro Skateboarding Legend Steve Caballero. After Steve drove the car for a while he felt the need to change the car “that everyone knew as Buddy’s old car” to his own. He then brought the car to his friend and fellow Road Zombies CC member Alex Gambino, who’s running Gambino Kustoms in San Jose. I desided to give someone else the opportunity to own it, as I needed to get rid of some creative itch. 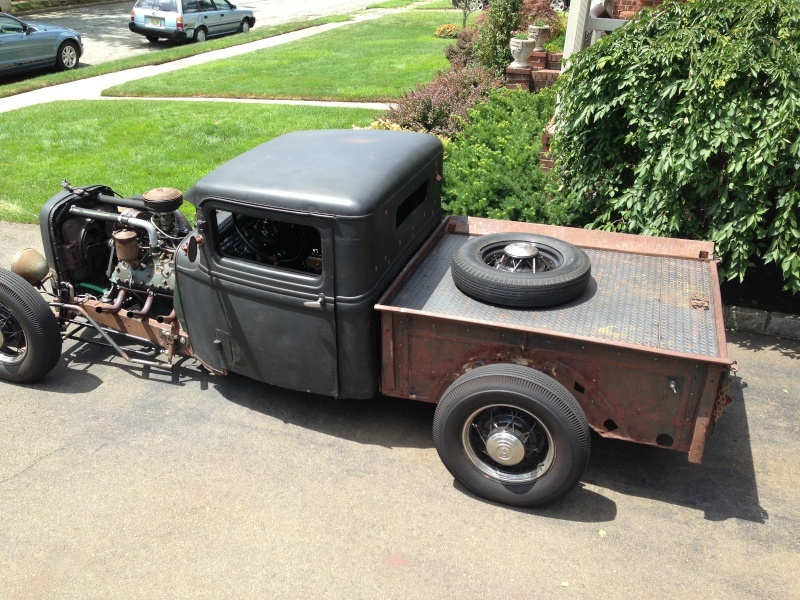 If you think I’d trailered this ride you’re wrong! 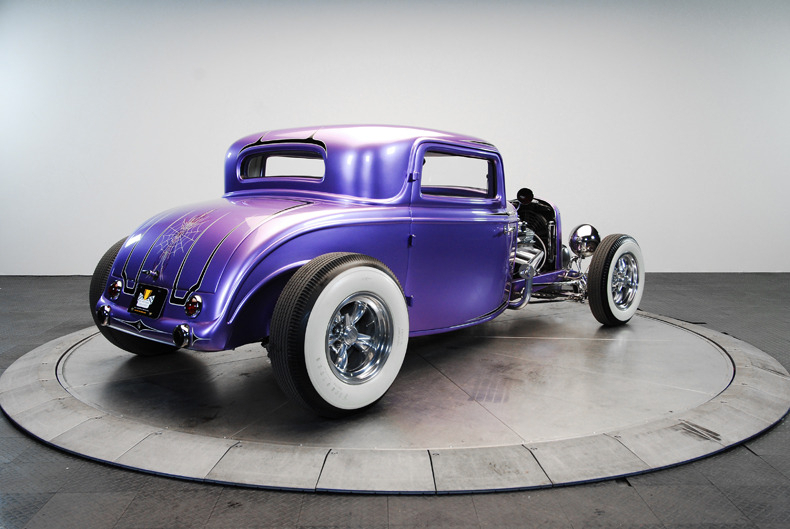 I’ve driven the hell out of it as that’s where Hot Rods are built for! I’ve made some long distance trips with it... also outside The Netherlands to! 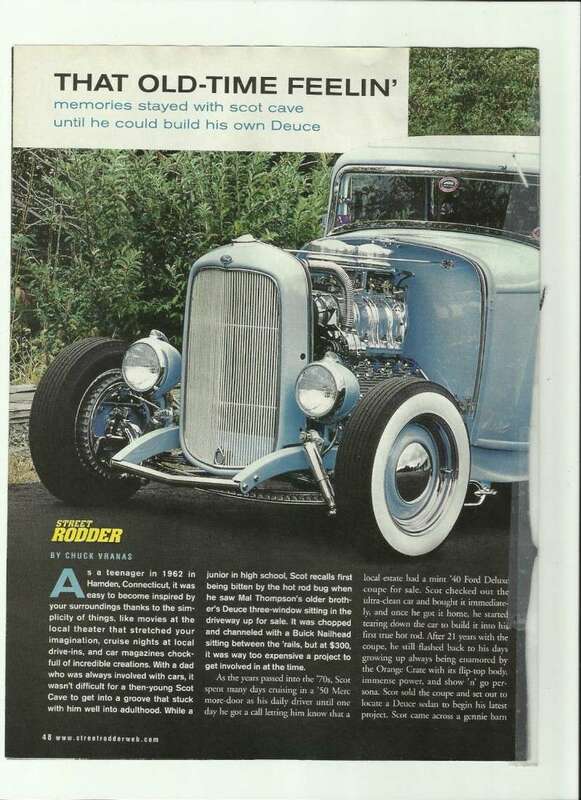 Car is also shown at several Hot Rod DVD’s such as: Mad fabricators Volume #5, Hot Rod Havoc 2, Shake Rattle and Roll, Hot Rods, Rat Rods & Kustom Kulture Back From The Dead. 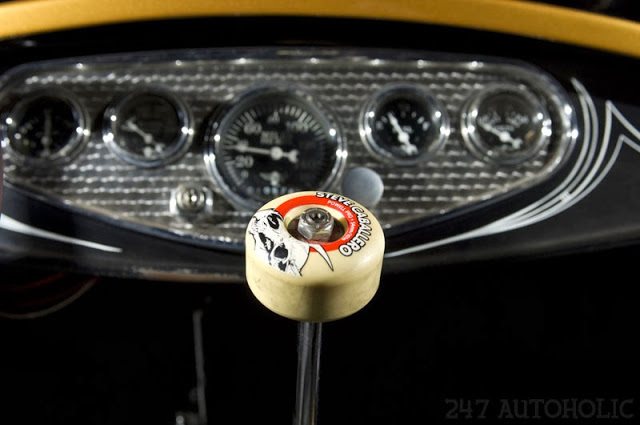 The coupe appeared ( and still is popping up ) in several Custom Scene' Art work and even did on Steve Caballero’s Powell skateboard, designed by Dirty Donny. 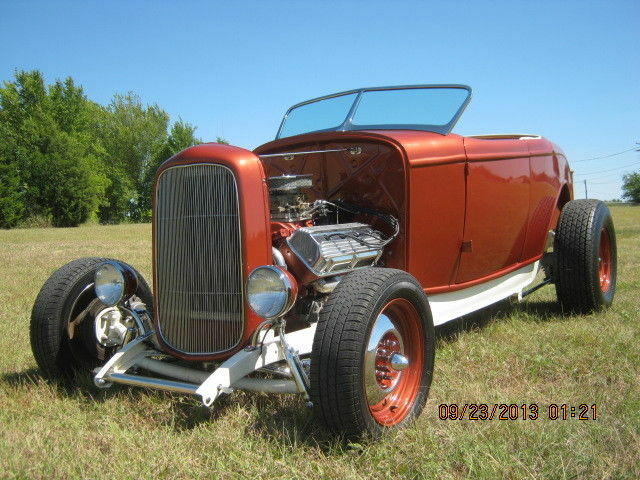 It’s an amazing traditional 60’s style hot rod. All Henry’s steel Ford. 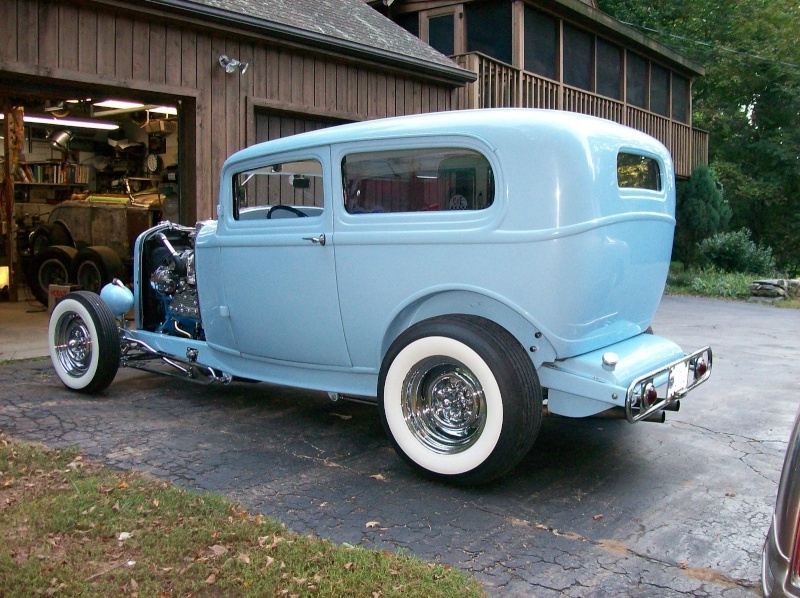 Top is chopped 5”. Body is channeled over the frame 4”. Original Model A frame which has been boxed. 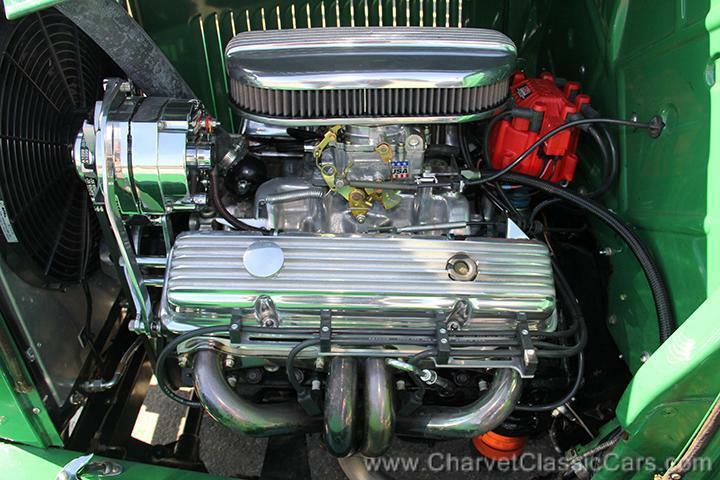 Reliable 350 small block Chevy V8 engine with Offenhauser 3X2 aluminum intake with Rochester carbs. All carbs work and are hooked up with straight linkage (not progressive). Running 4 pounds of fuel pressure. Sanderson chrome lake style headers, incl removable block off plates. GM 350 Turbo transmission with chrome finned pan. Brand new 4” recessed firewall. Real Don Zig magneto ignition supplies the spark. King chrome 65 amp one wire alternator mounted low on drivers side. 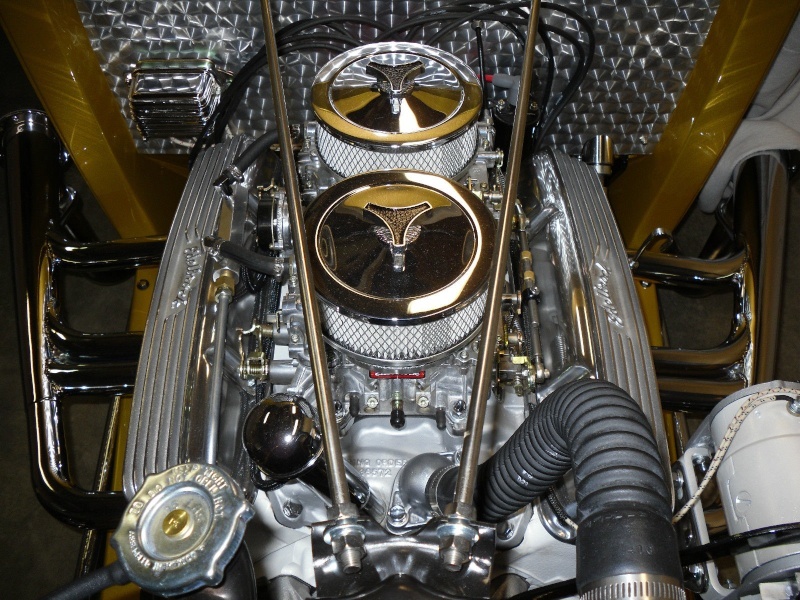 Cal-Custom finned valve covers and oil pan. Original steel 1932 Ford grill shell. Chrome Pete and Jake’s shocks. 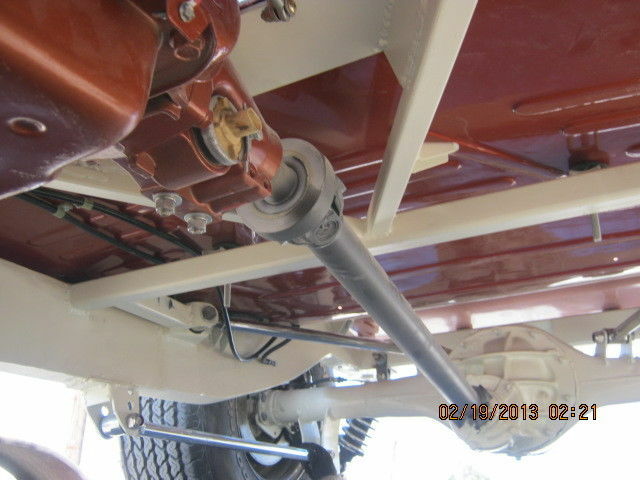 So-Cal Speed Shop steering stabilizer. 1940 Ford hydraulic drum brakes front and rear. Front window with polished stainless steel frame. 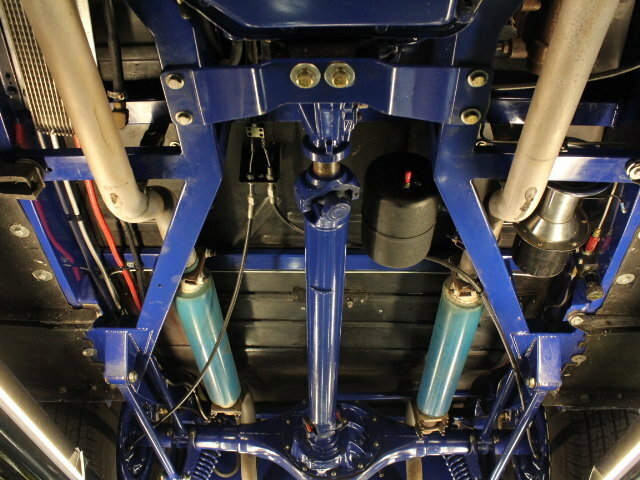 Mopar 8 ¾ rear end with coil over shocks. 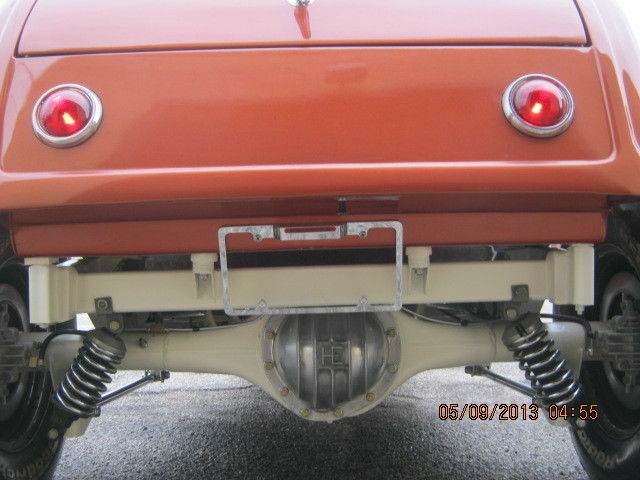 Smitthy’s glass pack mufflers with duel exhaust. 15” steel wheels, rim centers painted gold and black to match with trim rings and chrome lug nuts. 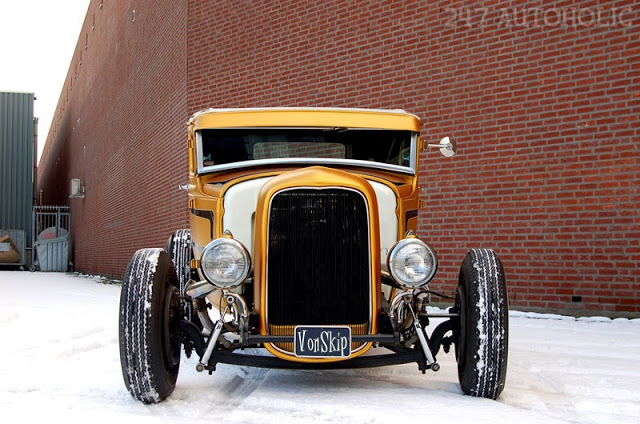 1932 Ford dash (striped by Skratch). 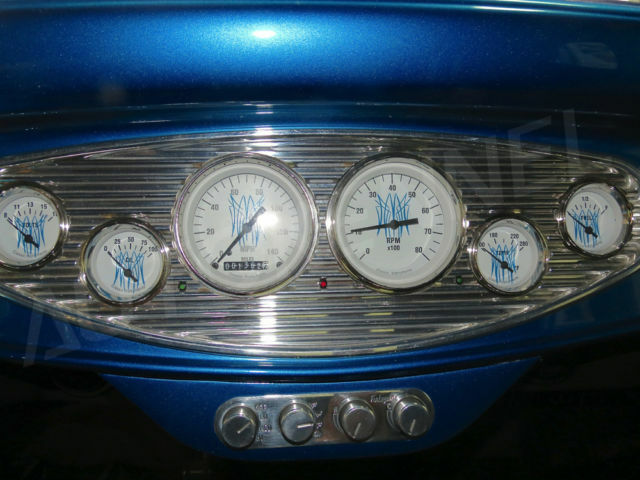 Stewart Warner gauges; Oil pressure, Temperature, Speedo, Fuel, Volts. Mounted in 5 gauge engine turned panel. Guide headlights with high and low beams. 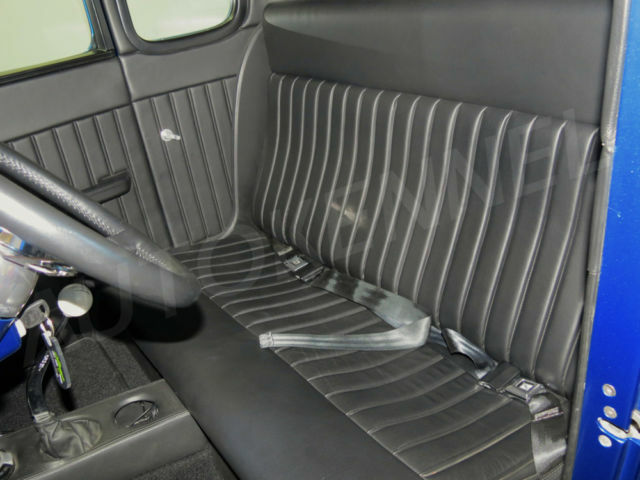 Black tuck and rolled bench seat. Came with rare early 1930 California Year of Manufacture plates.